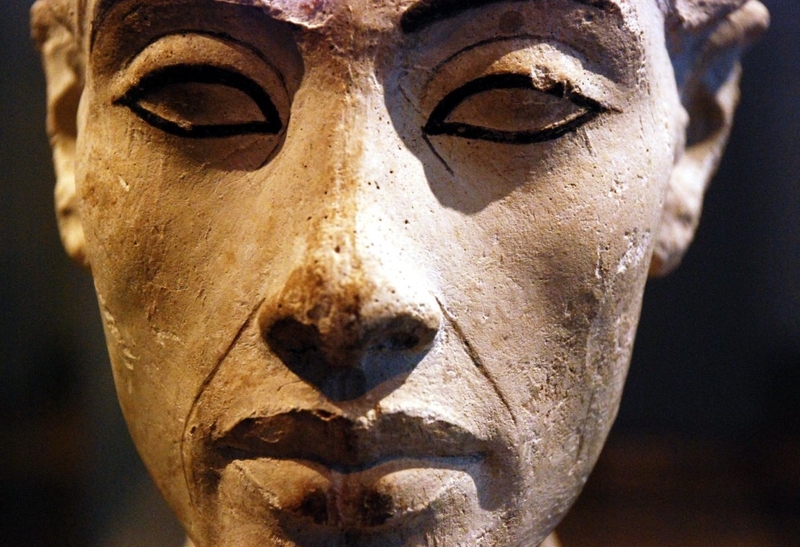 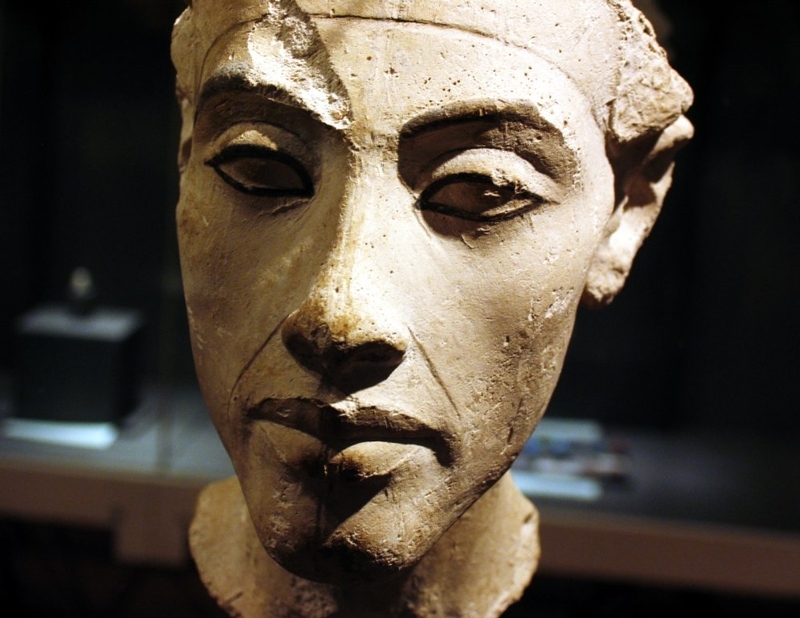 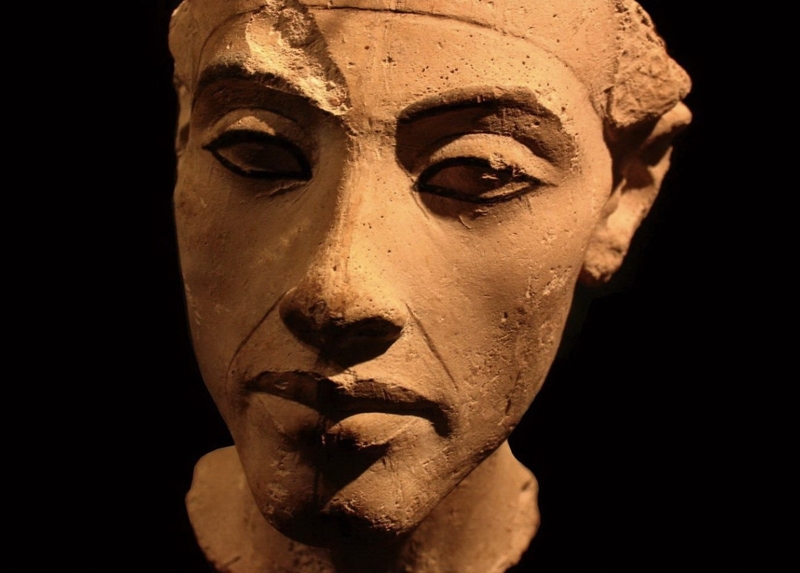 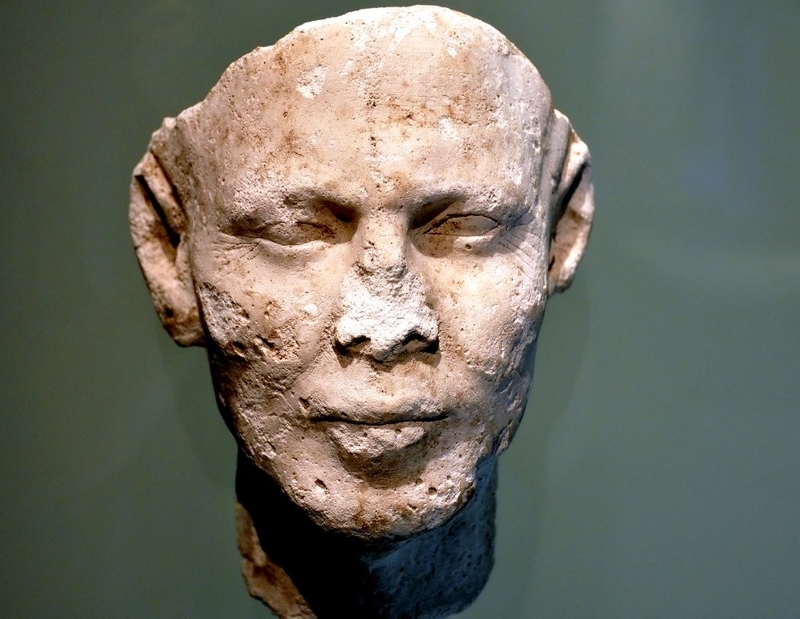 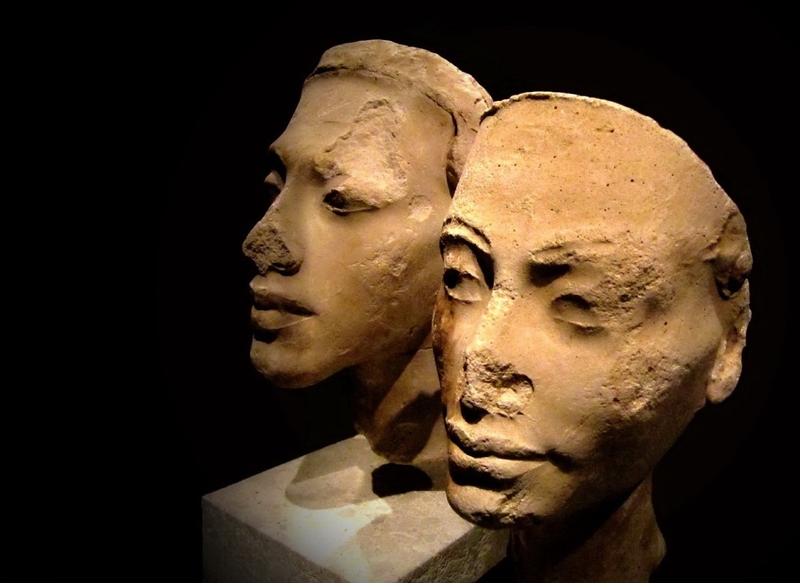 The King's Favourite and Master of Works, the Sculptor Thutmose - (also spelled Djhutmose and Thutmosis), flourished 1350 BC, is thought to have been the official court sculptor of the Egyptian Pharaoh Akhenaten in the latter part of his reign. 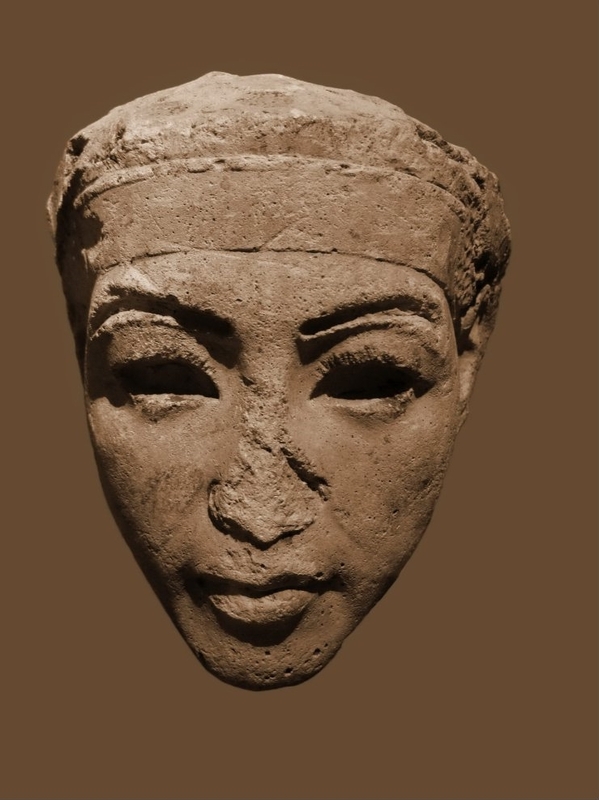 German archaeological expedition digging in Akhenaten's deserted city of Akhetaten, at Amarna, found a ruined house and studio complex (labeled P47.1-3) in early December 1912; the building was identified as that of Thutmose based on an ivory horse blinker found in a rubbish pit in the courtyard inscribed with his name and job title. 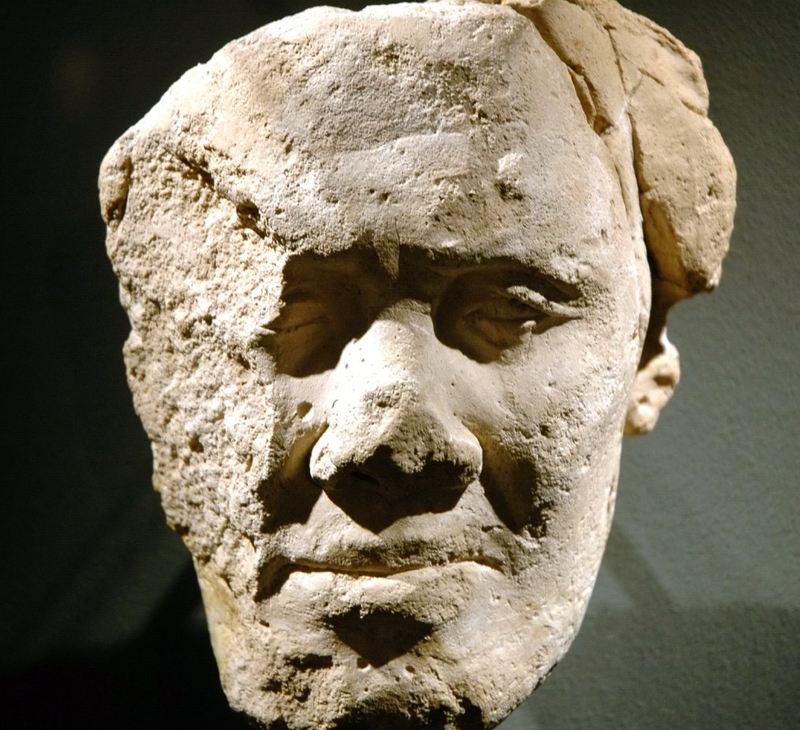 Since it gave his occupation as "sculptor" and the building was clearly a sculpture workshop, it seemed a logical connection. 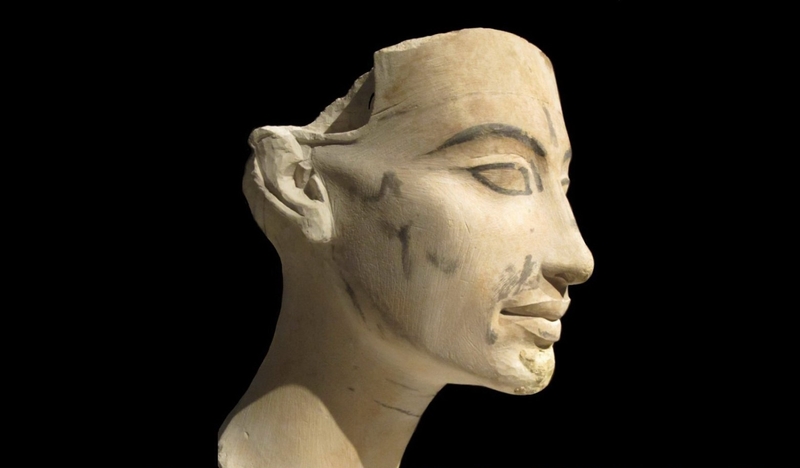 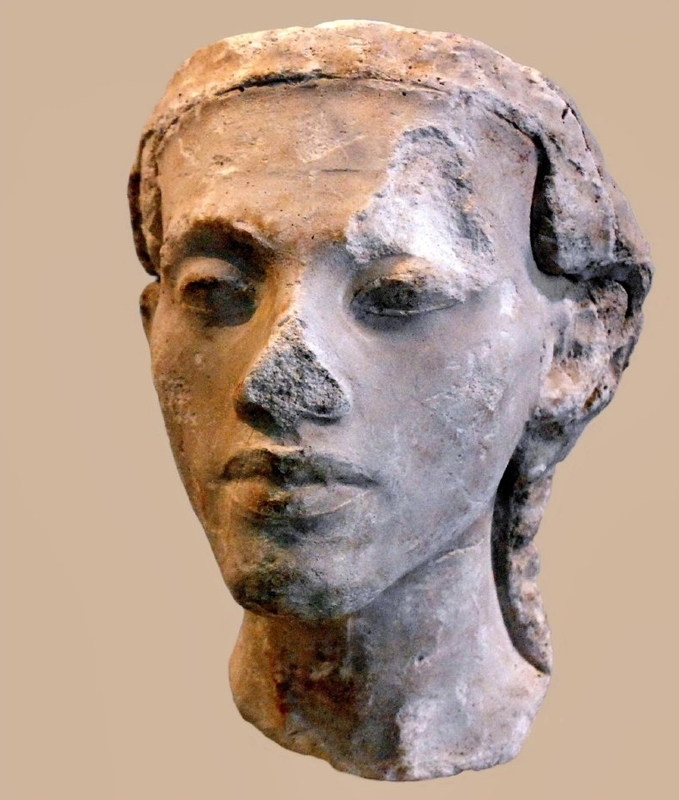 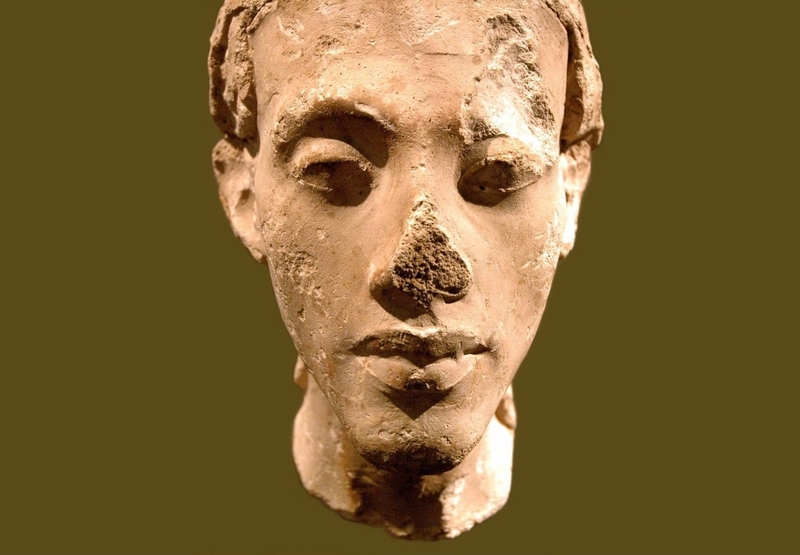 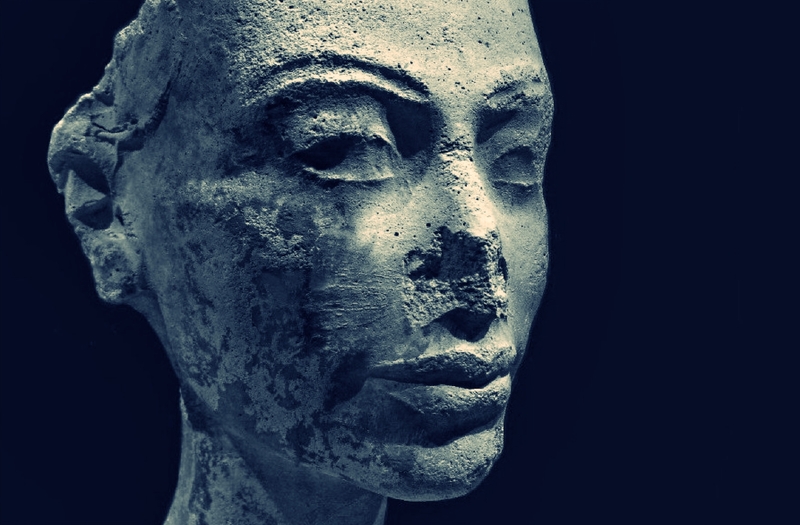 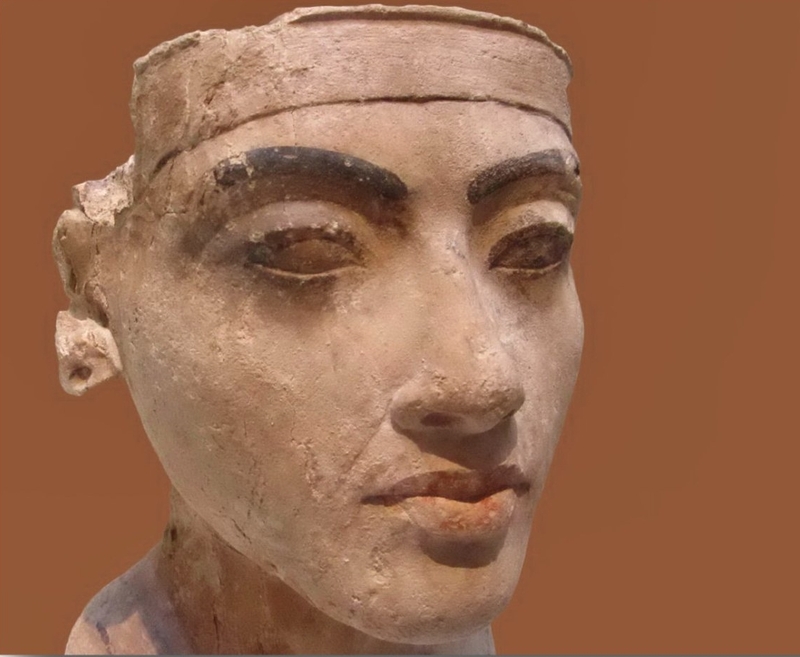 Among many other sculptural items recovered at the same time was the polychrome bust of Nefertiti**, apparently a master study for others to copy, which was found on the floor of a storeroom. 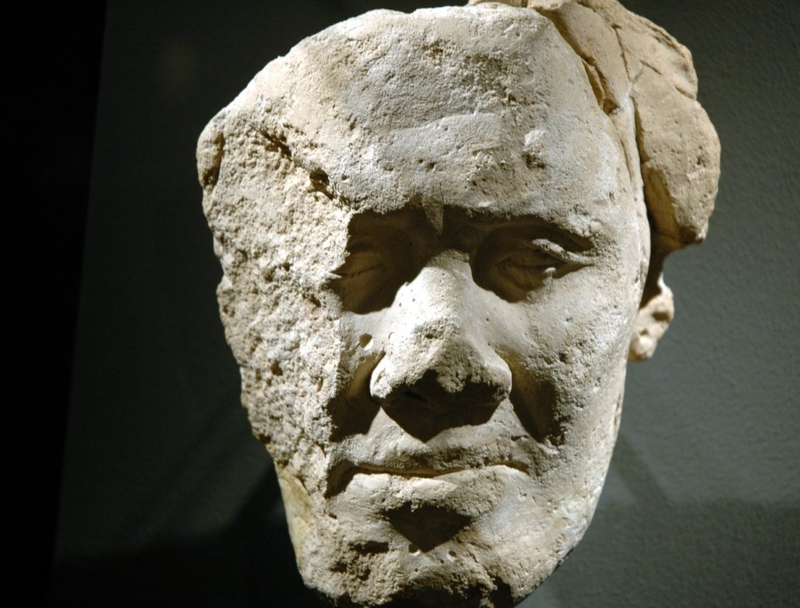 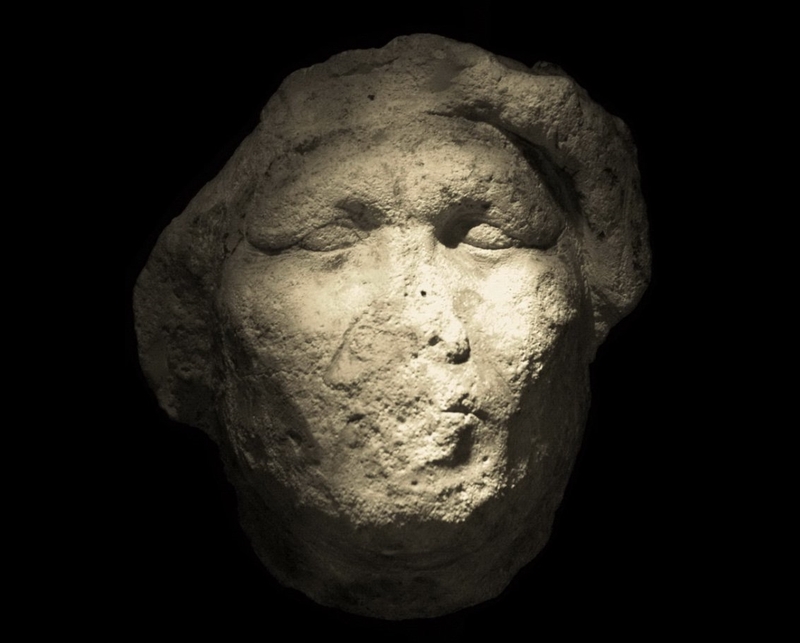 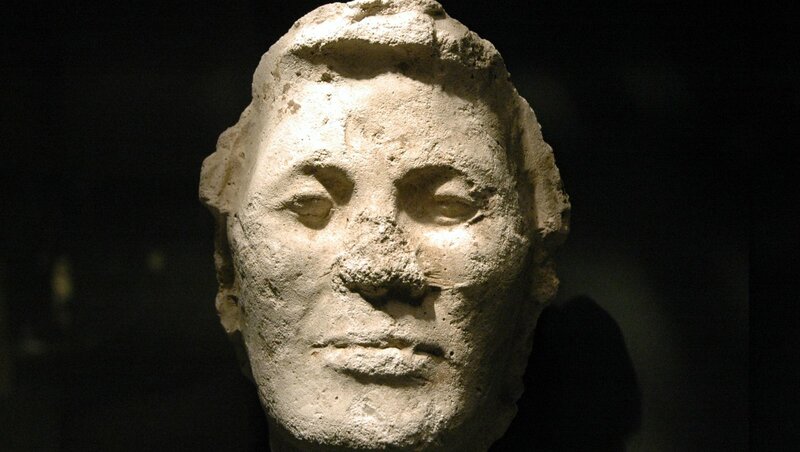 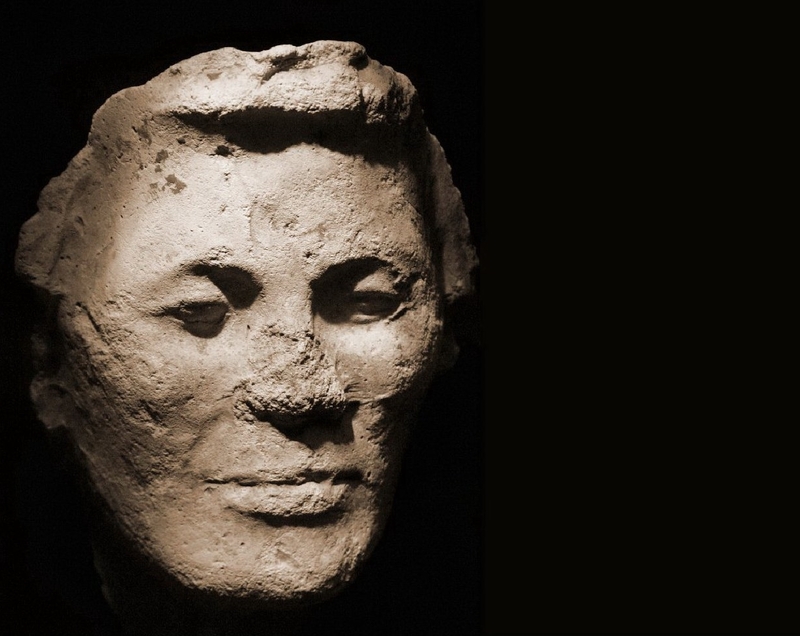 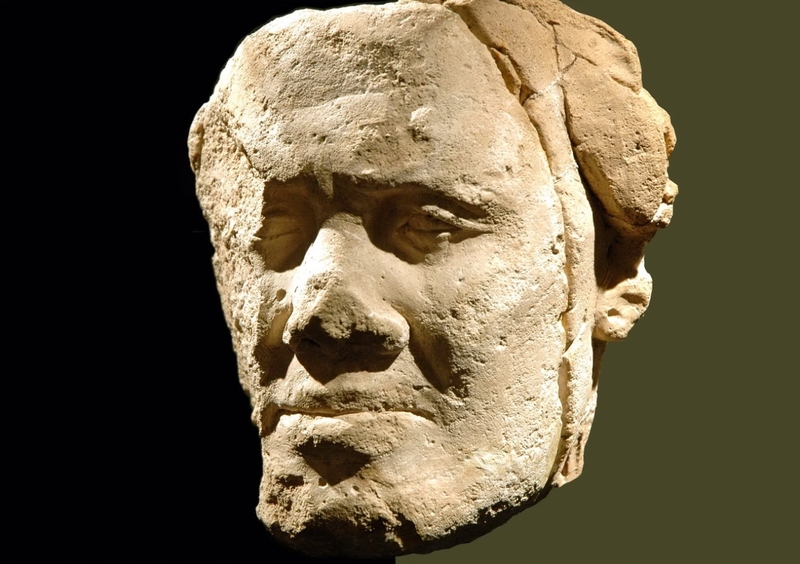 In addition to this now-famous bust twenty-two plaster casts of faces - some of which are full heads, others just the face - were found in Rooms 18/19 of the studio, with an additional one found in Room 14. 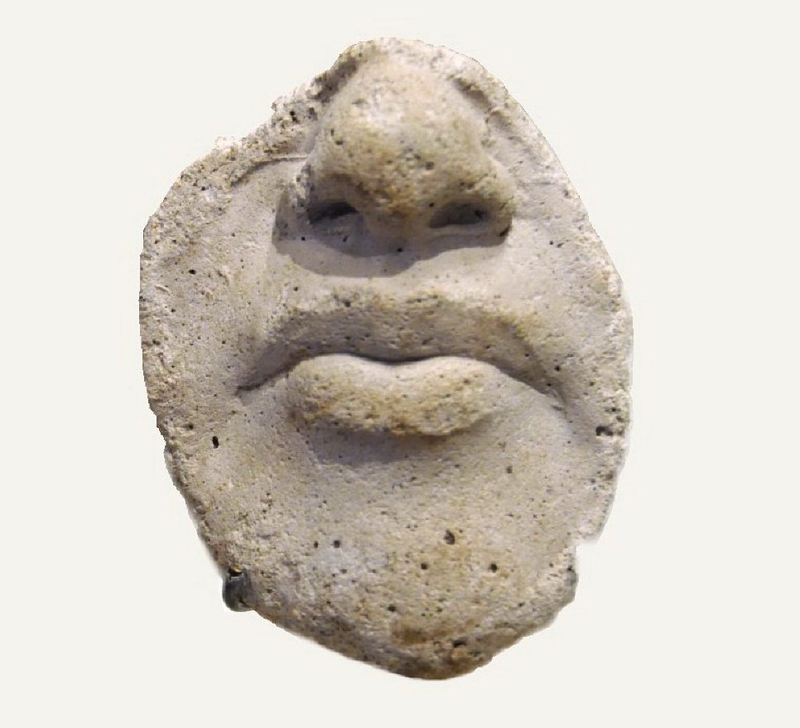 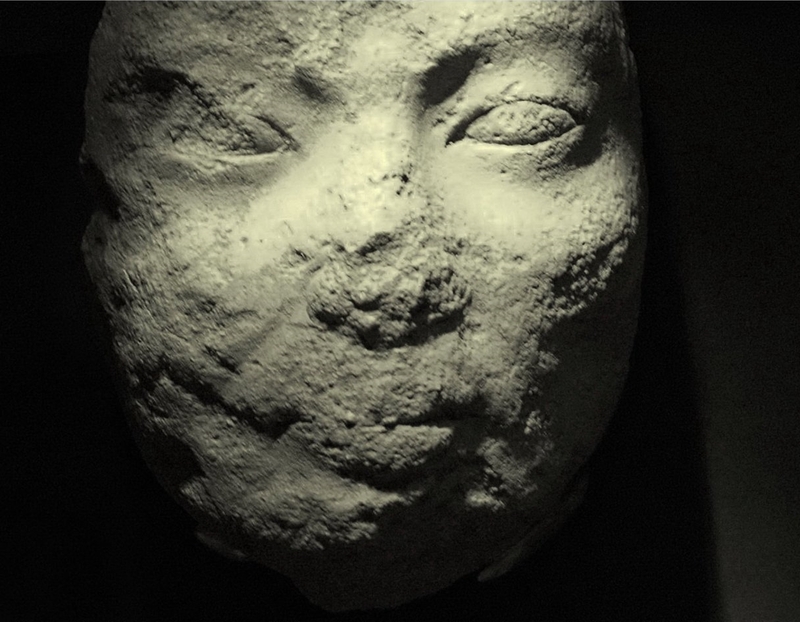 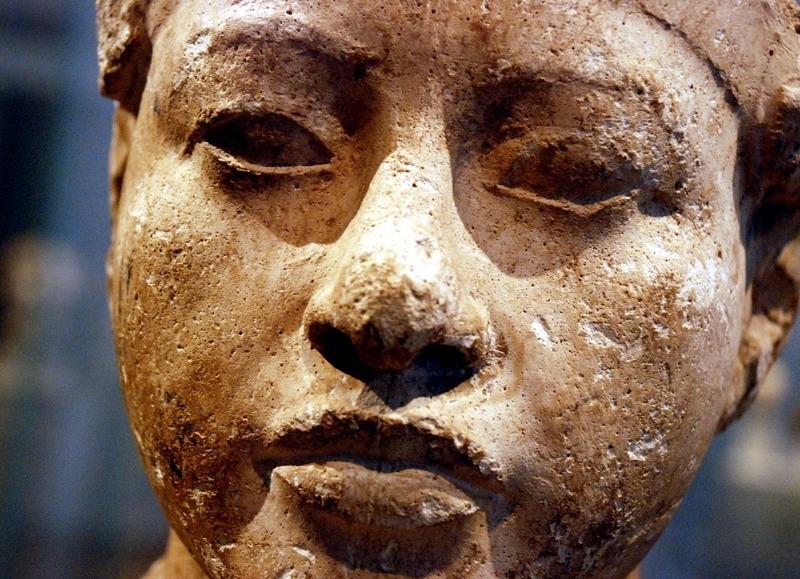 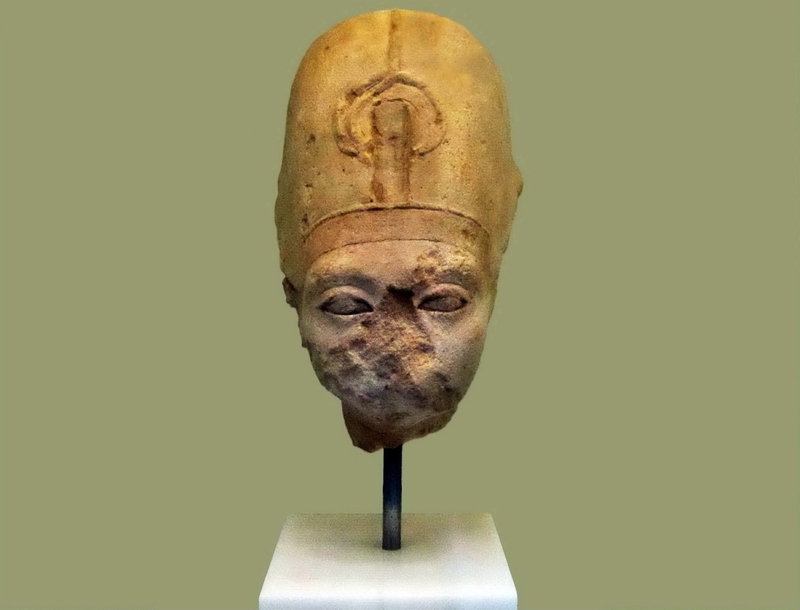 Eight of these have been identified as various members of the royal family including Akhenaten, his other wife Kiya, his late father Amenhotep III, and his eventual successor Ay. 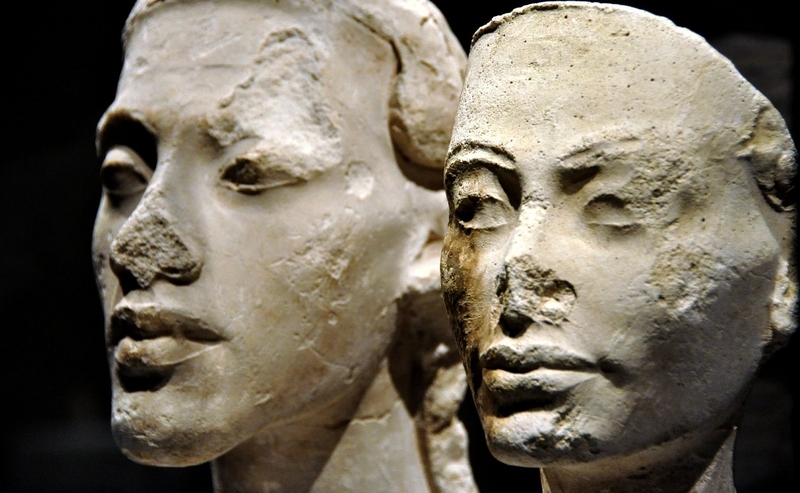 The rest represent unknown individuals, presumably contemporary residents of Amarna. 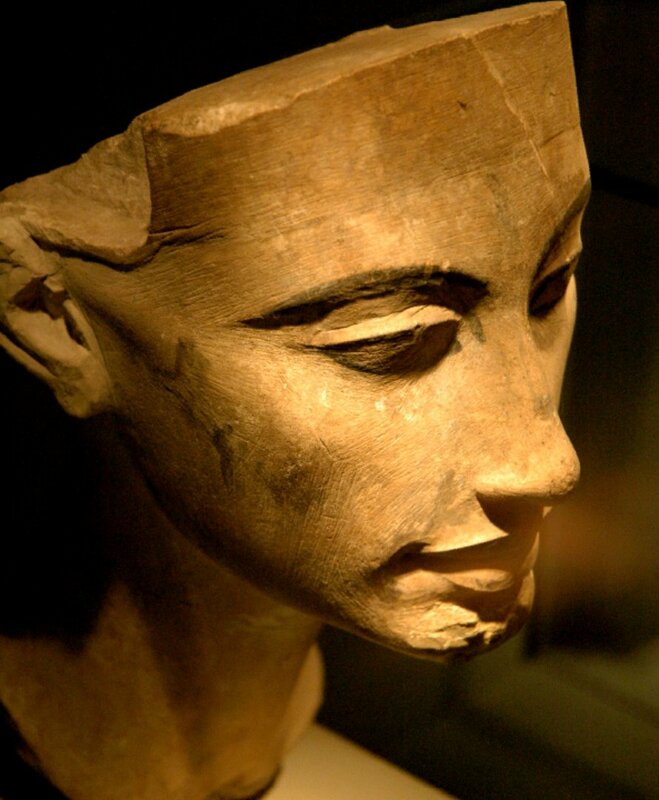 A couple of the pieces found in the workshop depict images of older noblewomen which is rare in Ancient Egyptian art**, which more often portrayed women in an idealized manner as always young, slender and beautiful. 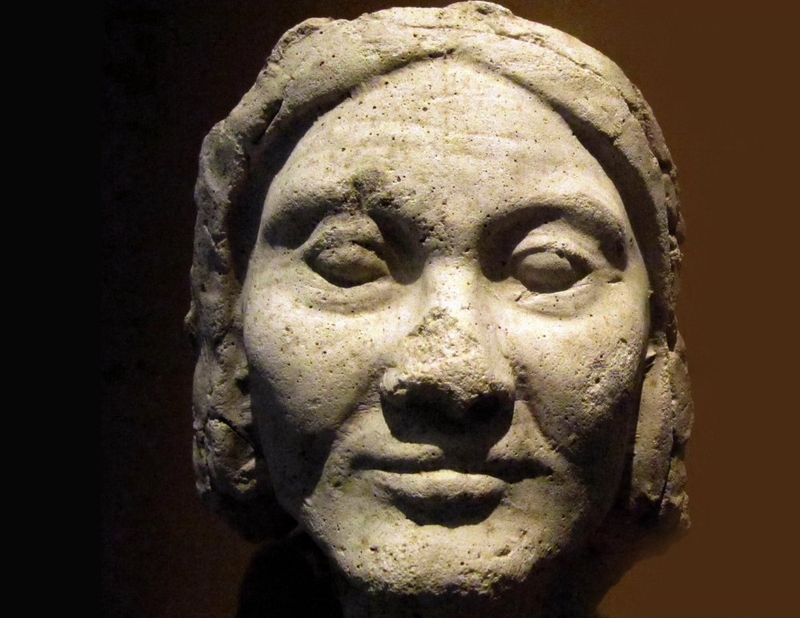 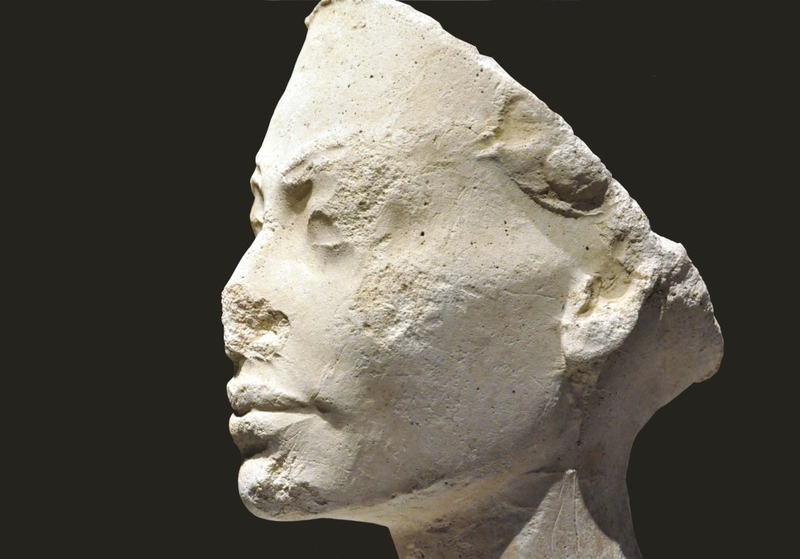 One of the plaster faces depicts an older woman, with wrinkles at the corner of her eyes and bags under them, and a deeply lined forehead. 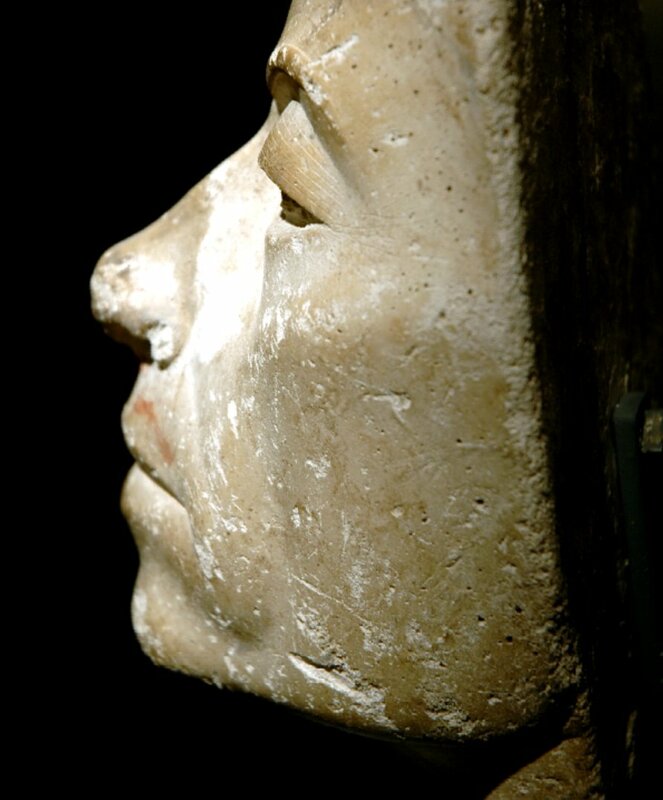 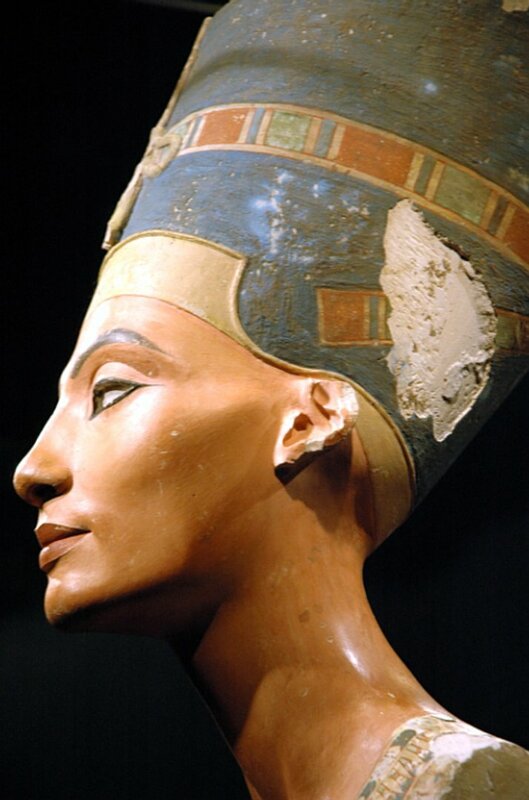 "a greater variety of wrinkles than any other depiction of an elite woman from ancient Egypt**". 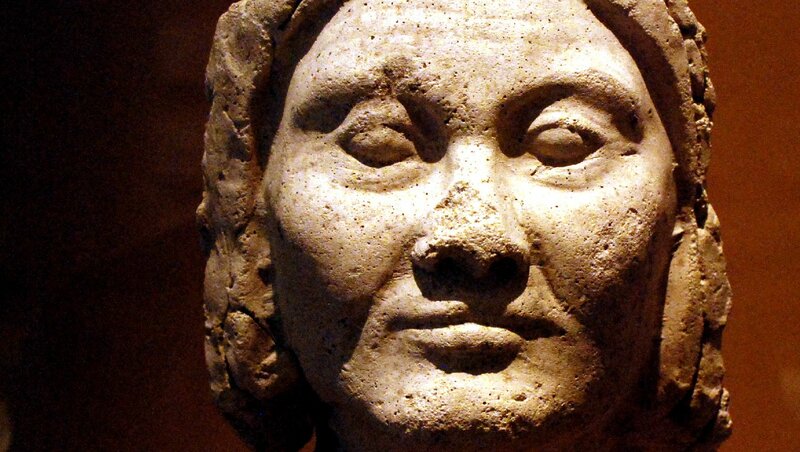 It is thought to represent the image of a wise, older woman. 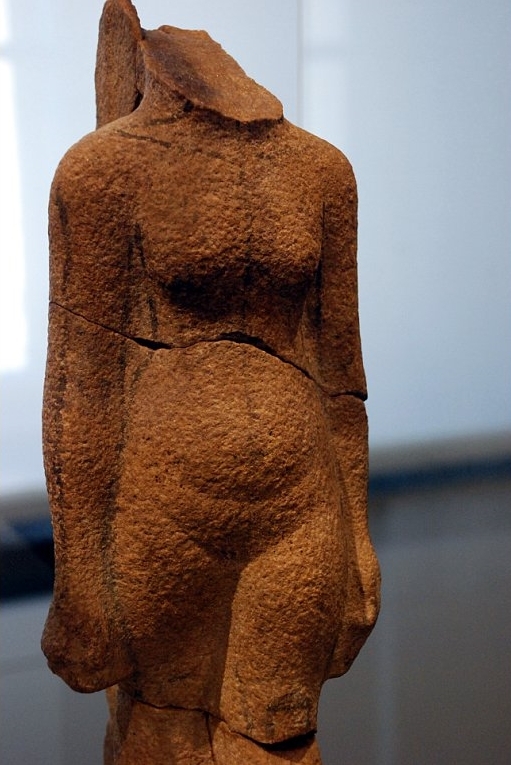 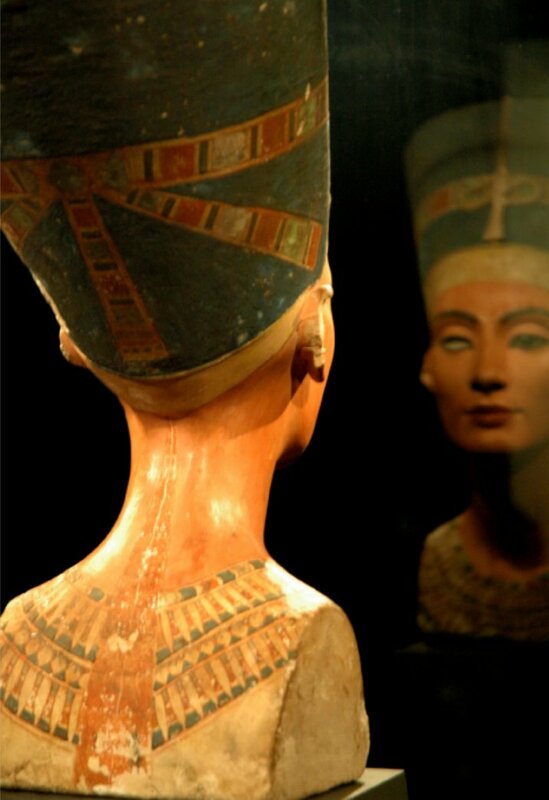 A small statue of an aging Nefertiti** was also found in the workshop, depicting her with a rounded, drooping belly and thick thighs and a curved line at the base of her abdomen showing that she had borne several children, perhaps to project an image of fertility. 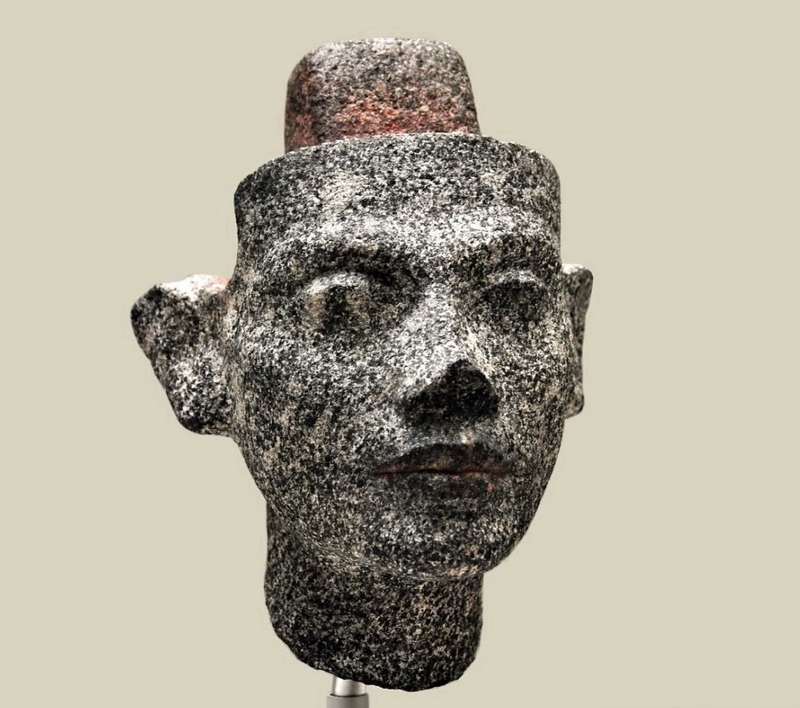 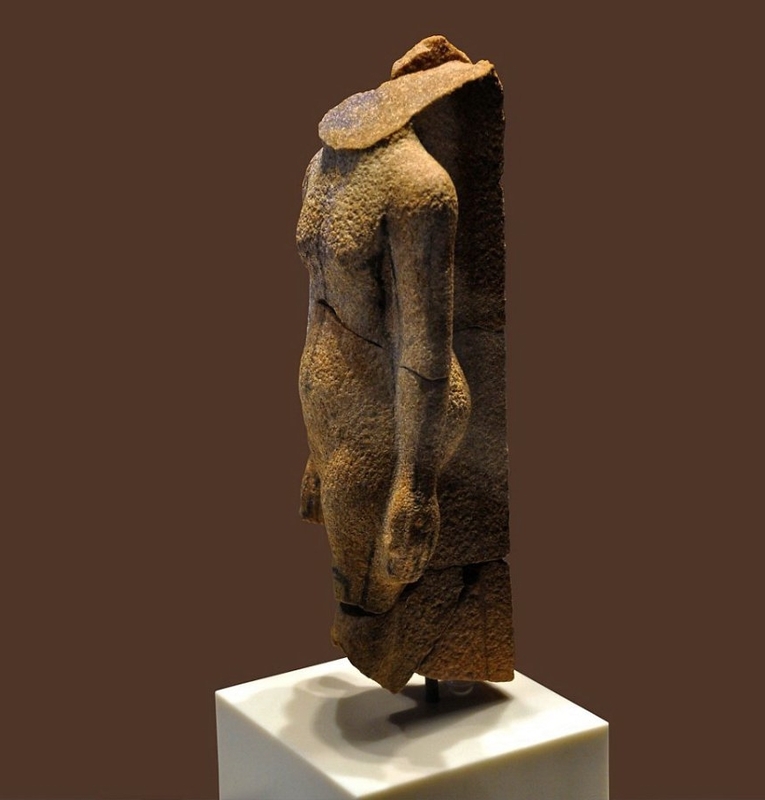 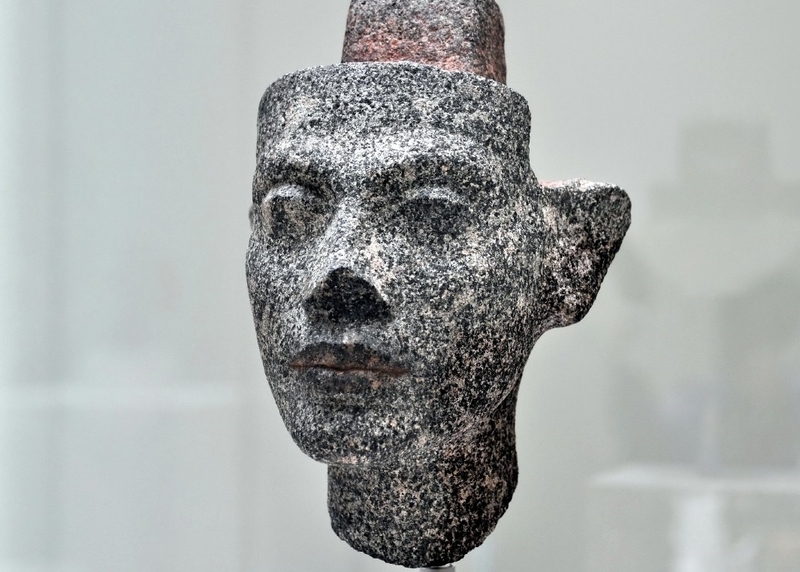 Examples of his work recovered from his abandoned studio can be viewed at the Ägyptisches Museum Berlin, the Cairo Museum, and the Metropolitan Museum of Art, New York City. 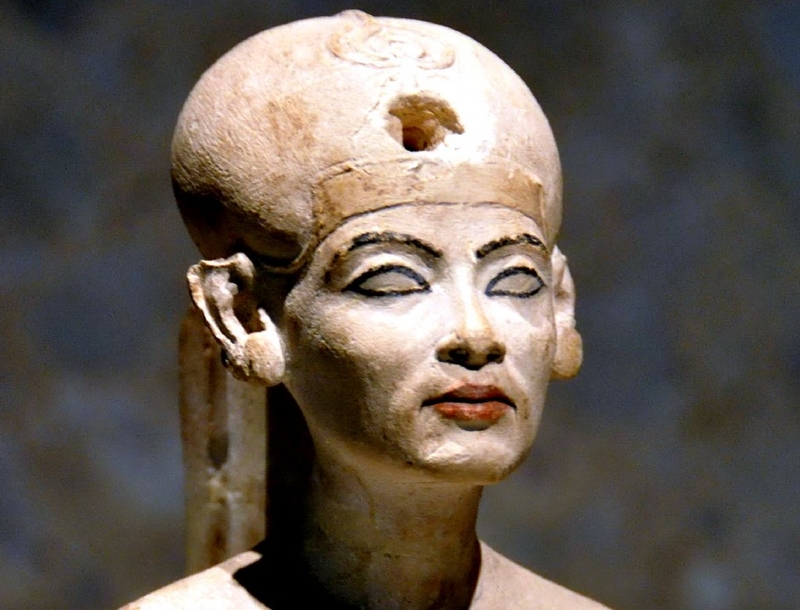 "head of the painters in the place of truth", Thutmose. 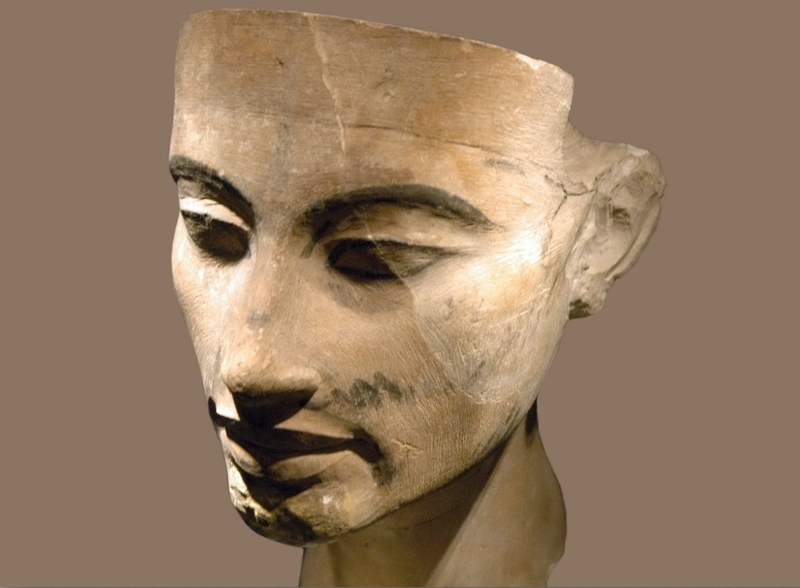 The tomb dates to the time shortly after the Amarna Period. 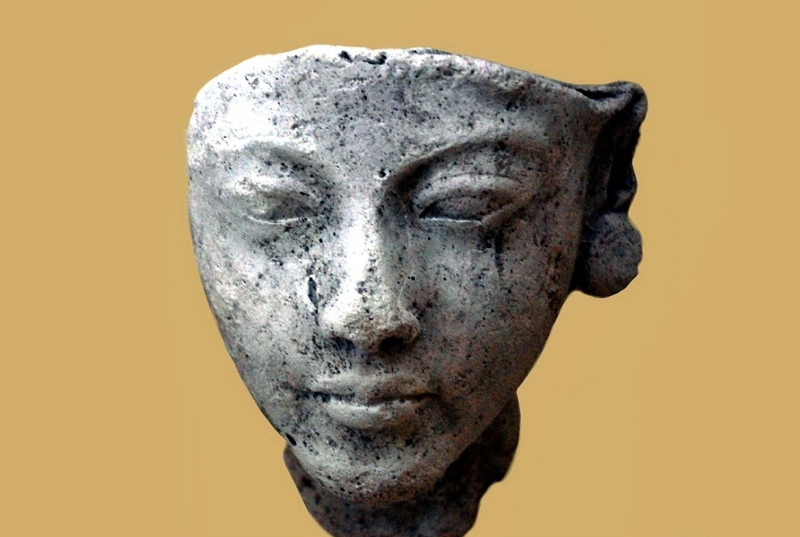 Thutmose (fl. 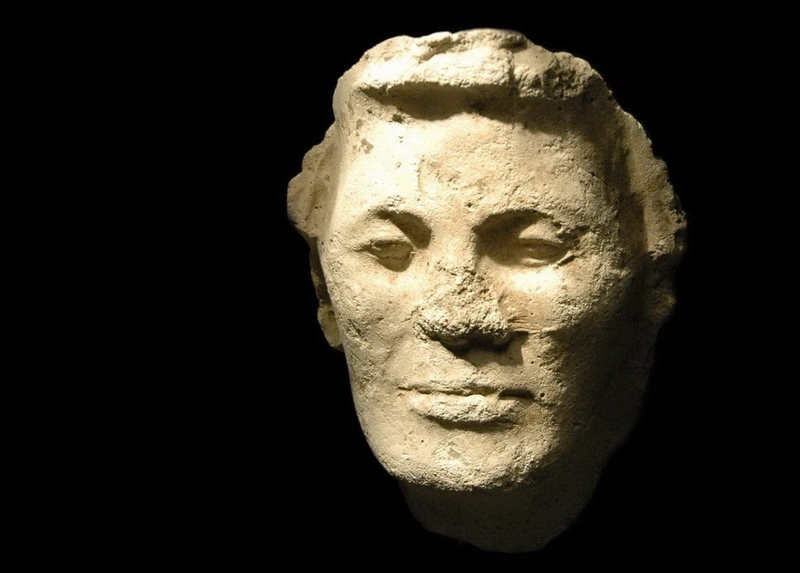 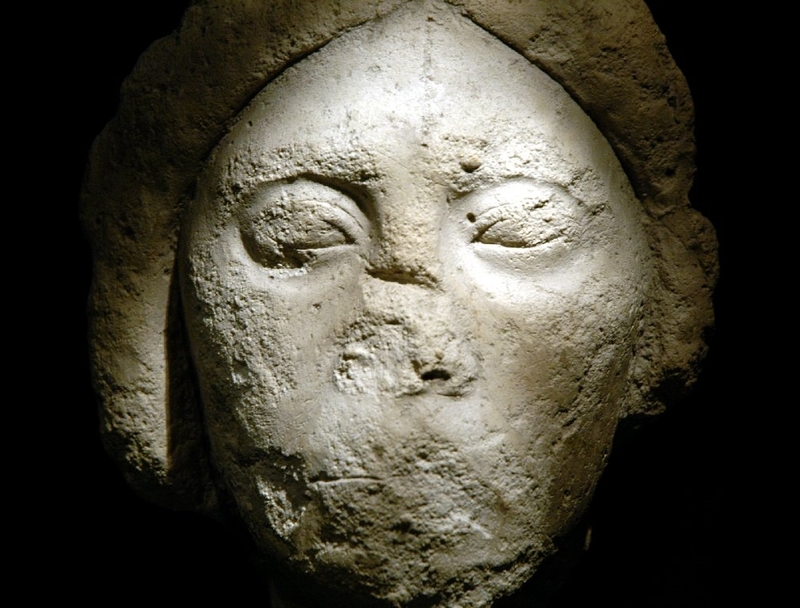 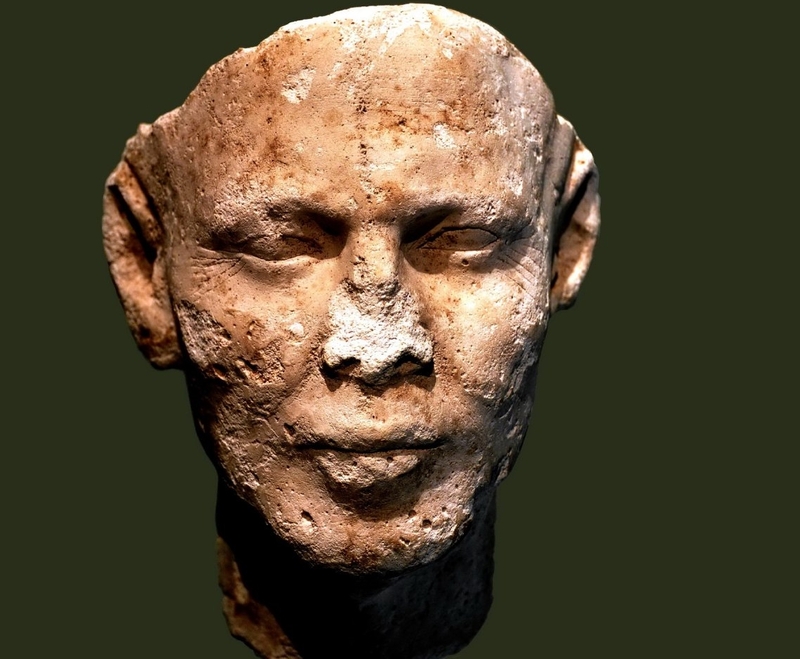 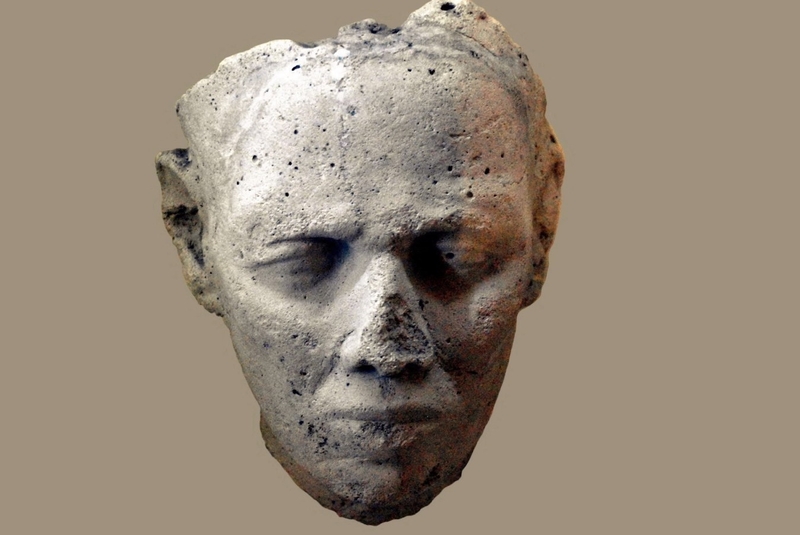 ca 1340 a.C. ± 50 anni; ... - ...) è stato un capo-scultore Egizio durante il tardo periodo del regno di Akhenaton, faraone della XVIII dinastia egizia. 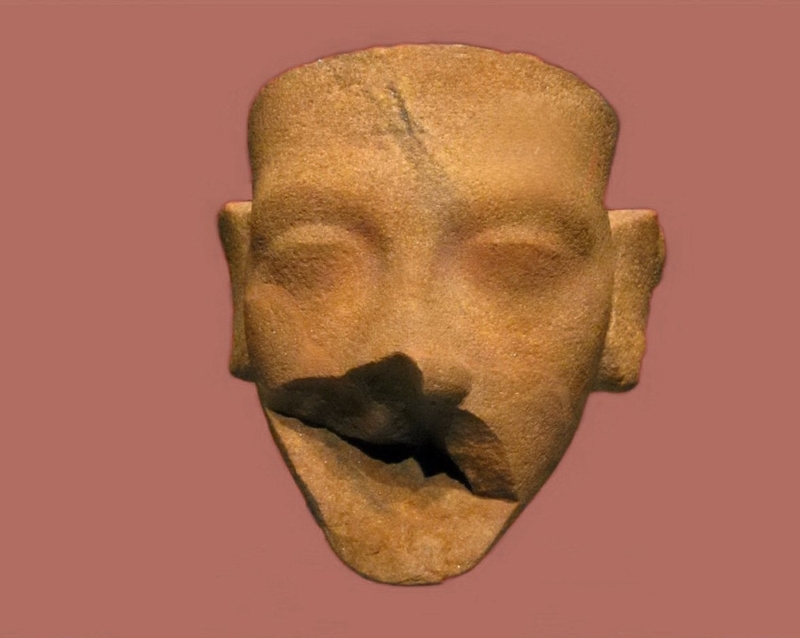 Nel dicembre 1912 una spedizione archeologica tedesca rinvenne, durante dei lavori di scavo tra le rovine di Akhetaton - la città voluta da Akhenaton - un edificio (etichettato come P 47) che venne interpretato come l'abitazione ed il laboratorio di uno scultore. 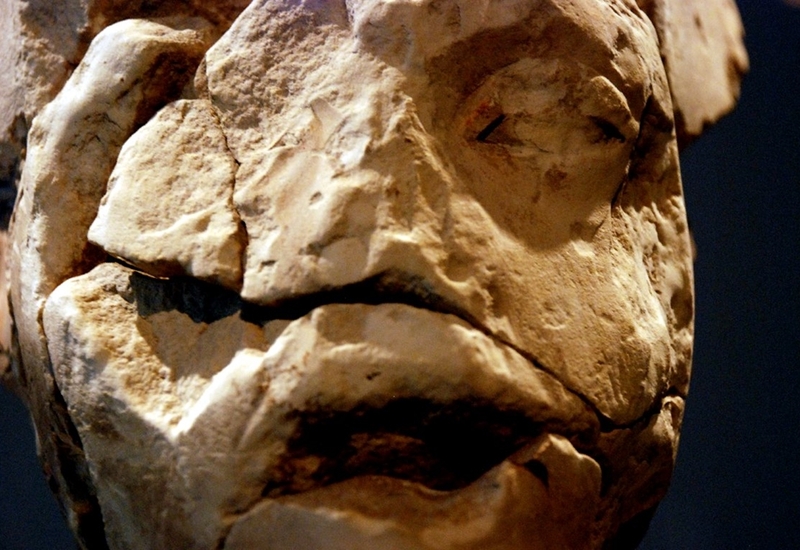 seguito dai titoli di Favorito del Re e Maestro dei lavori. 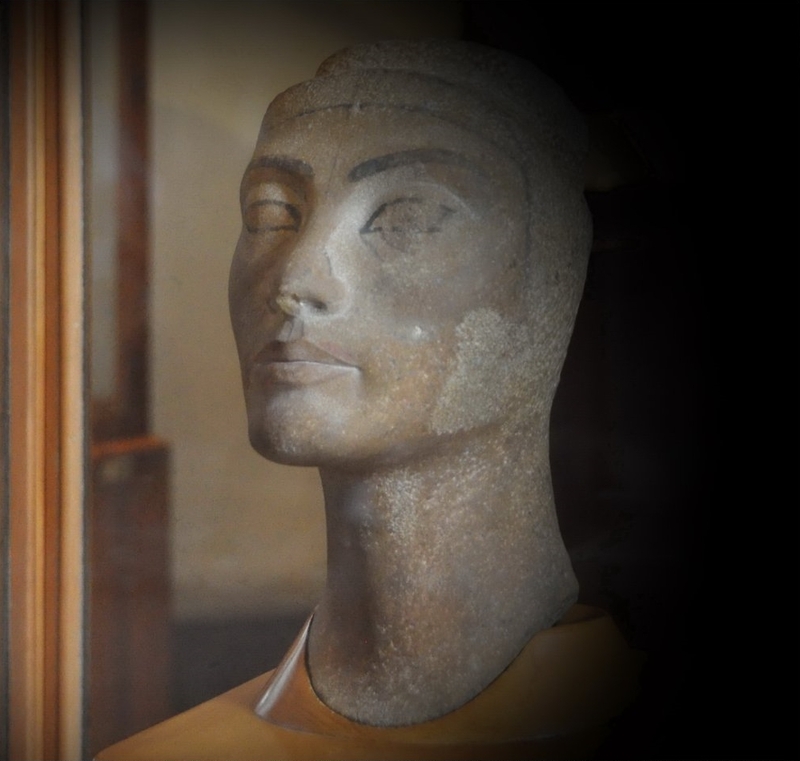 Come conseguenza di tale ritrovamento, la casa e lo studio annesso vennero attribuiti a questo personaggio. 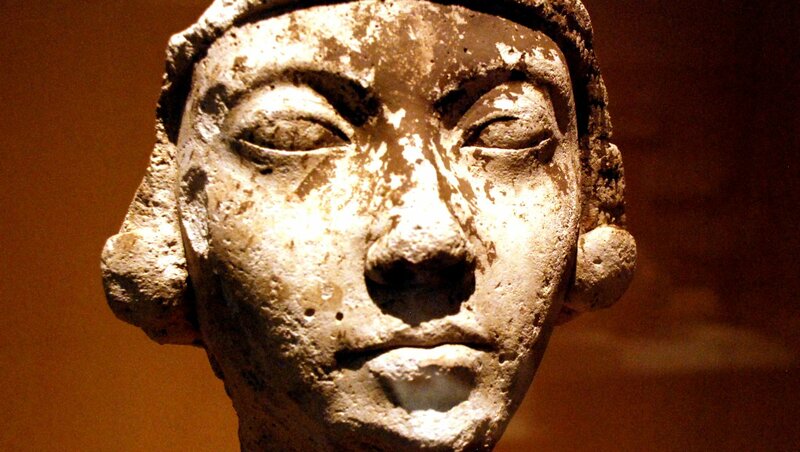 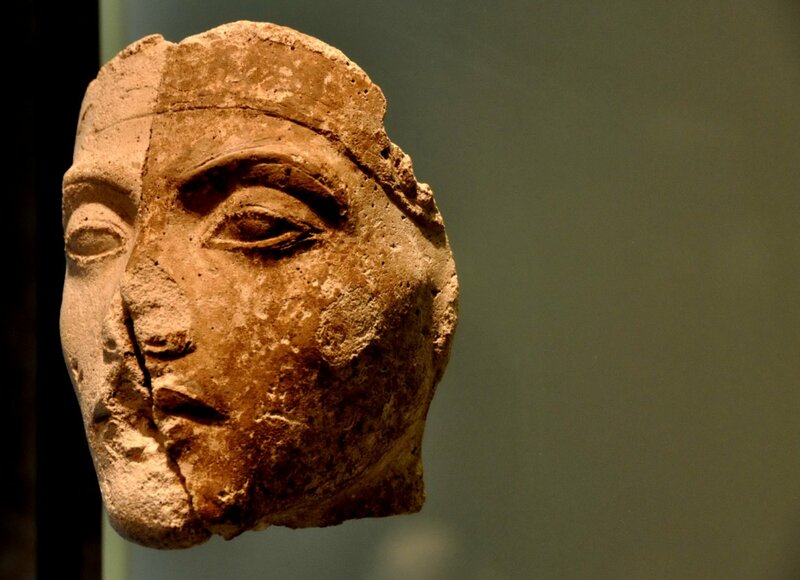 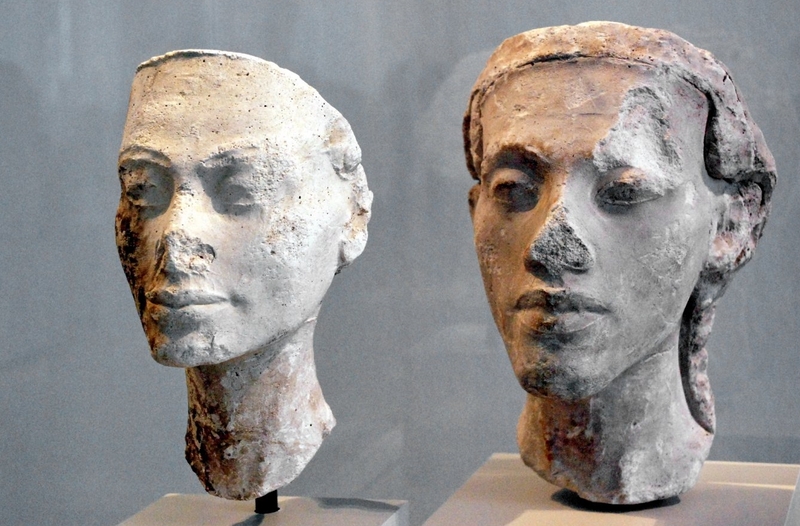 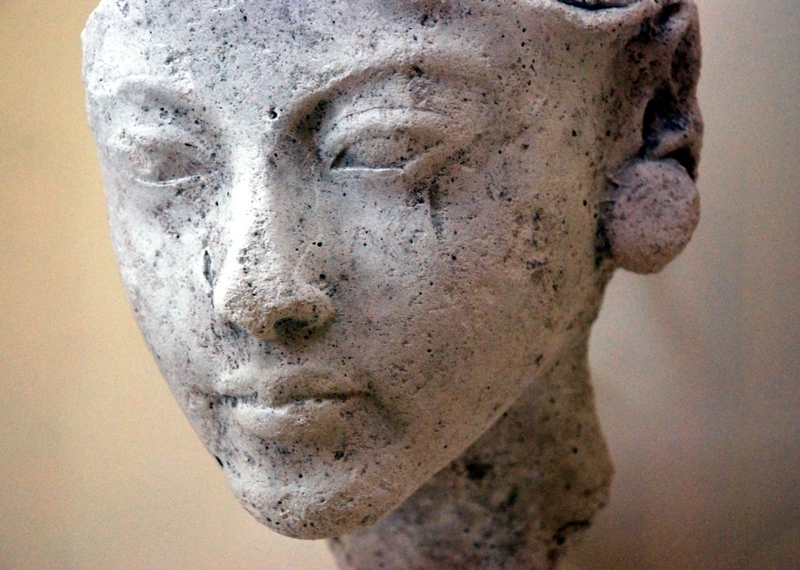 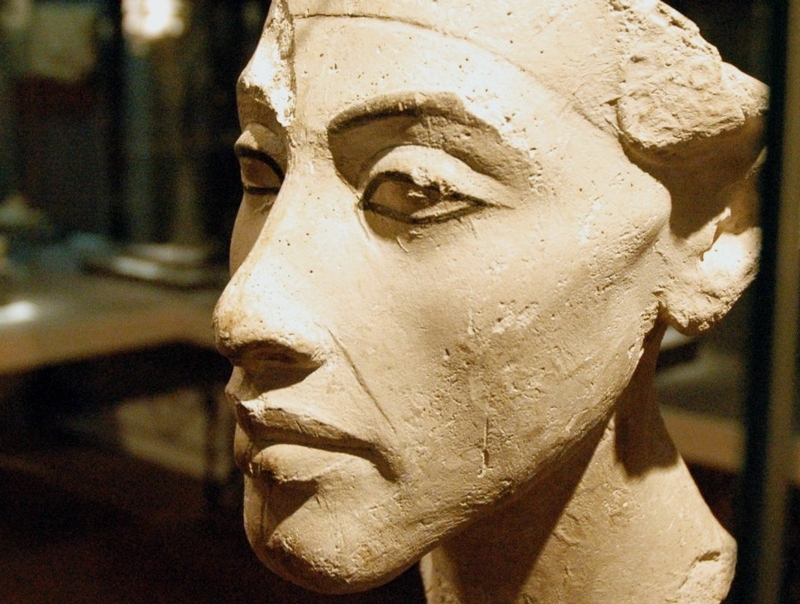 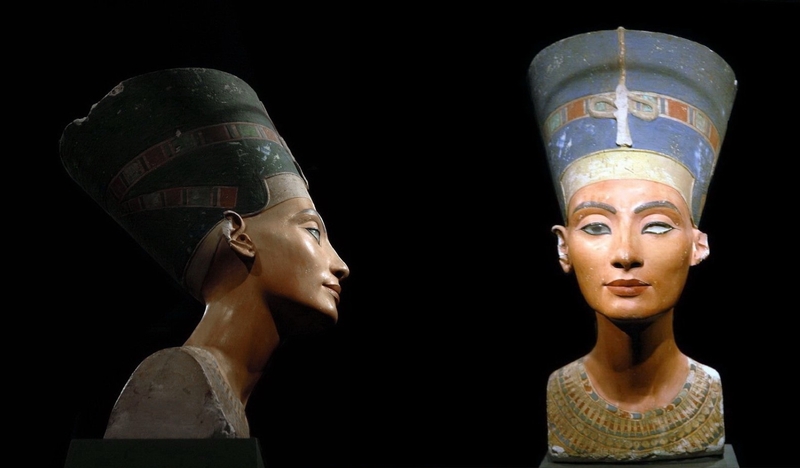 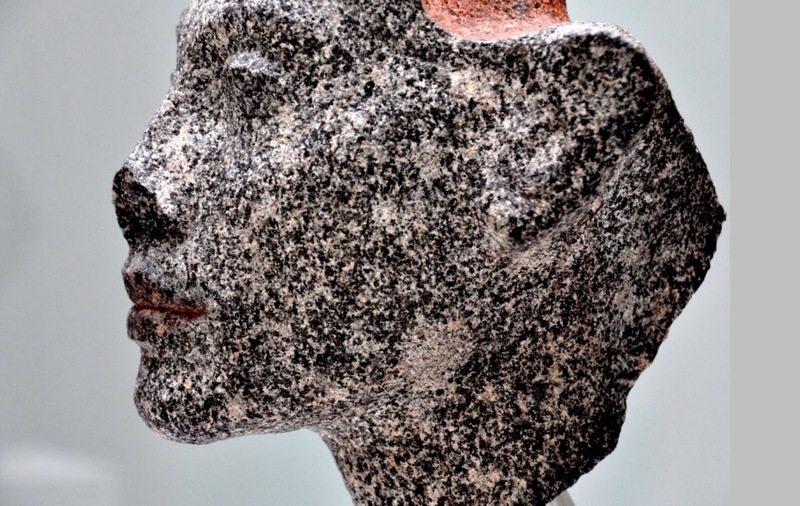 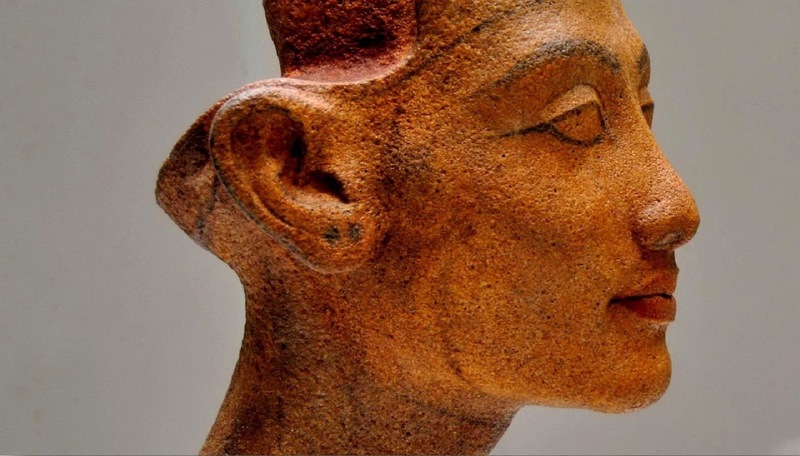 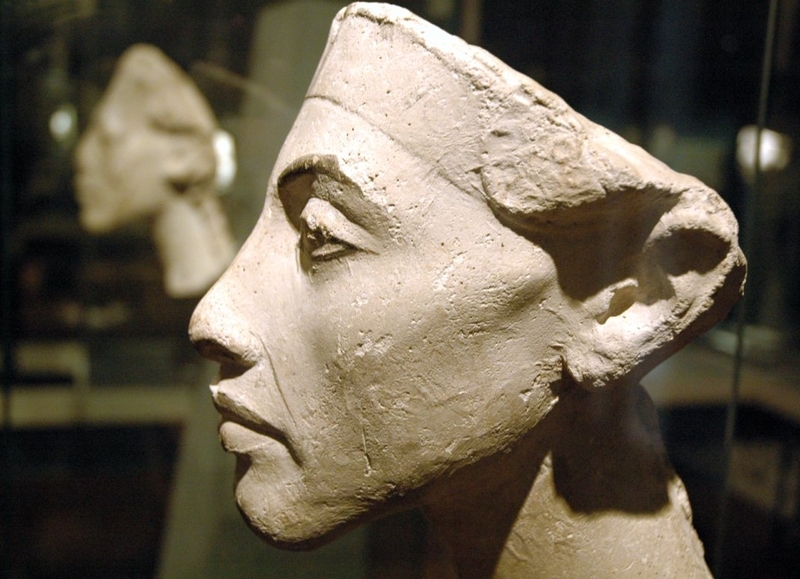 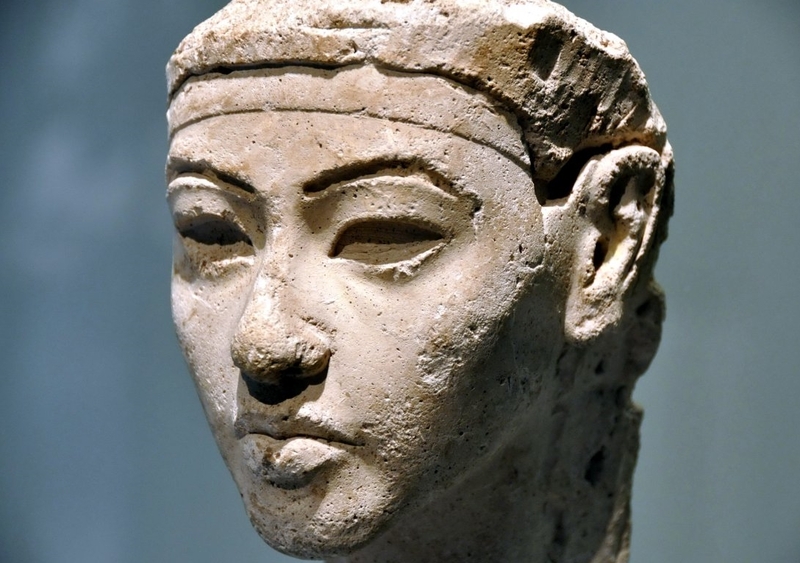 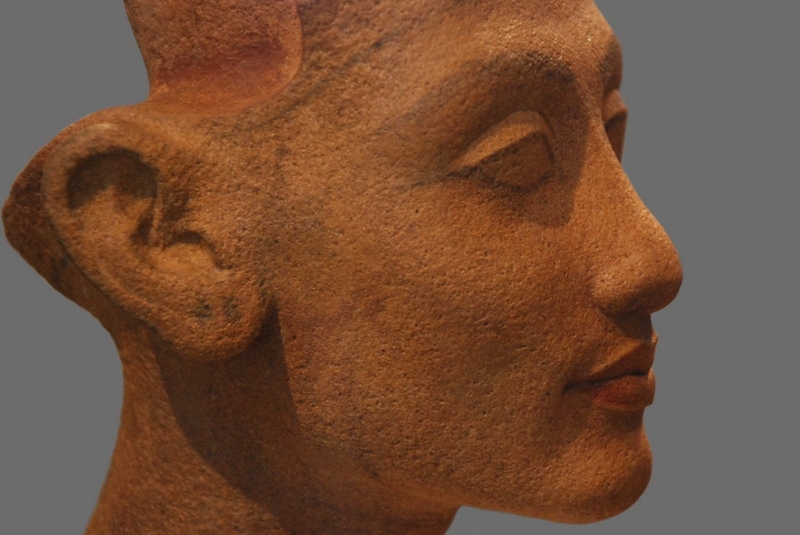 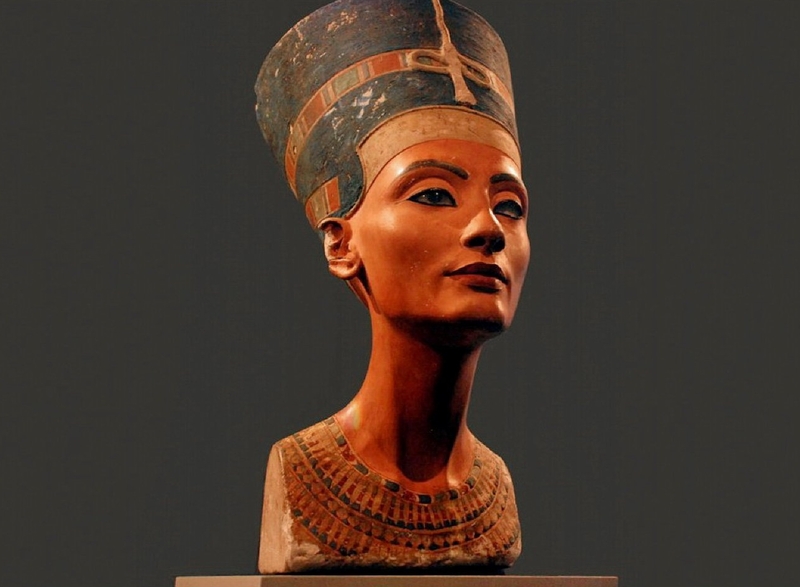 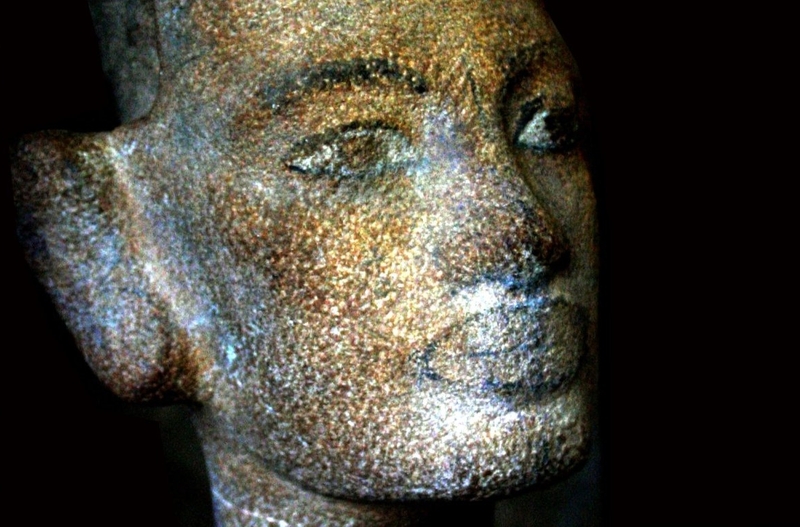 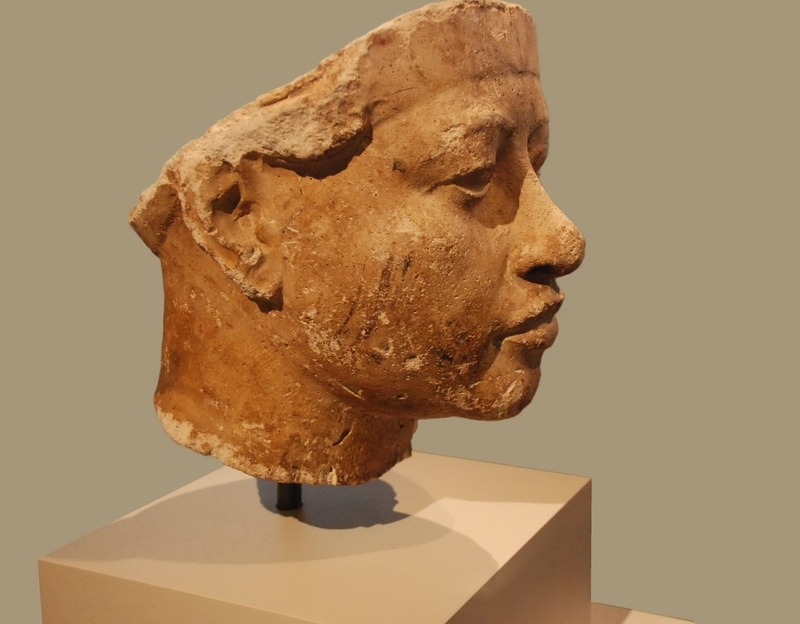 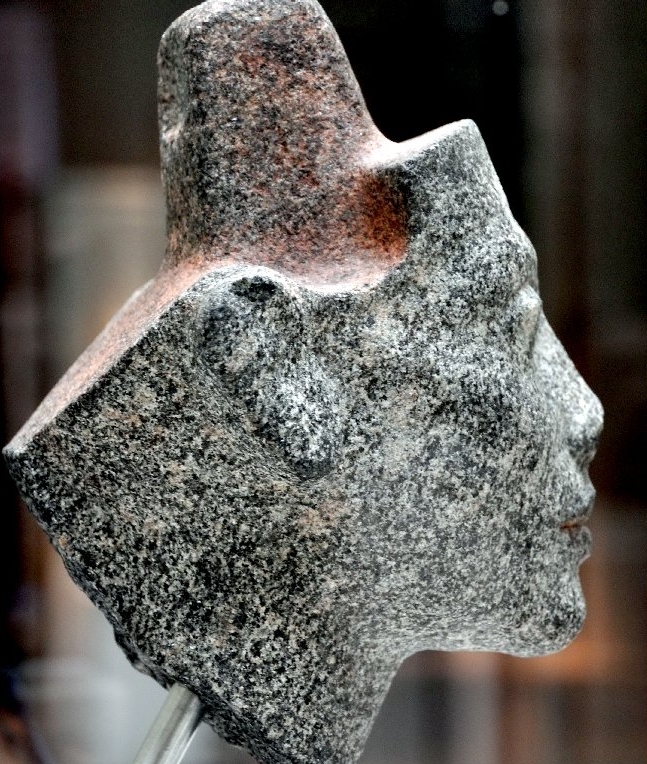 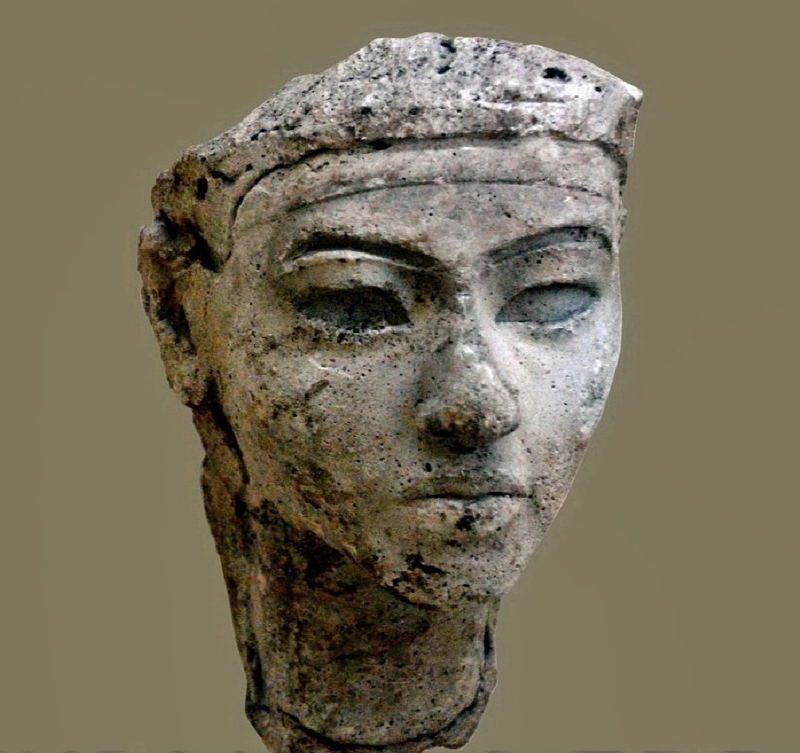 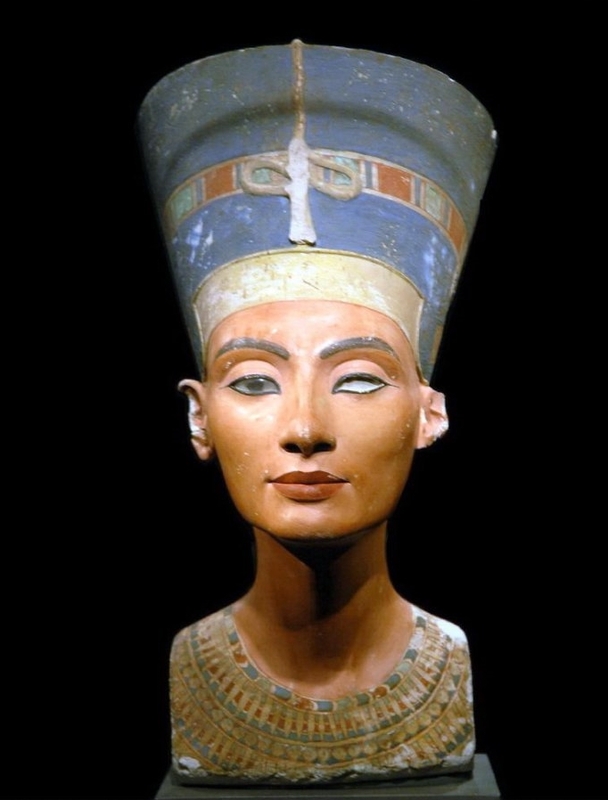 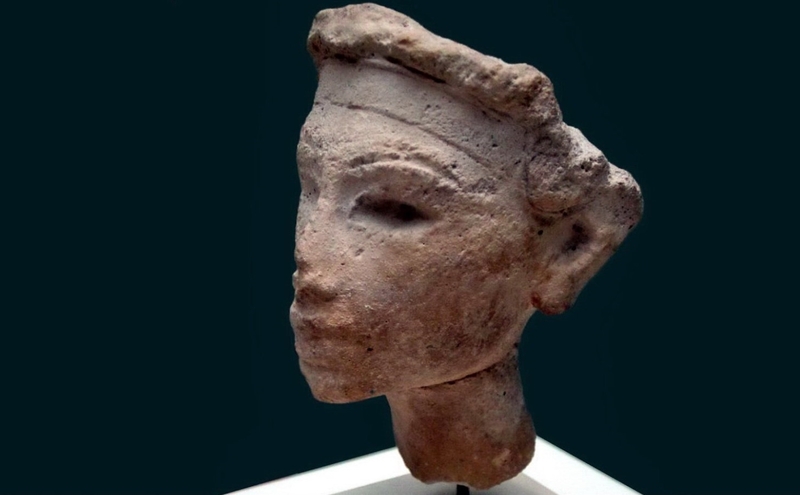 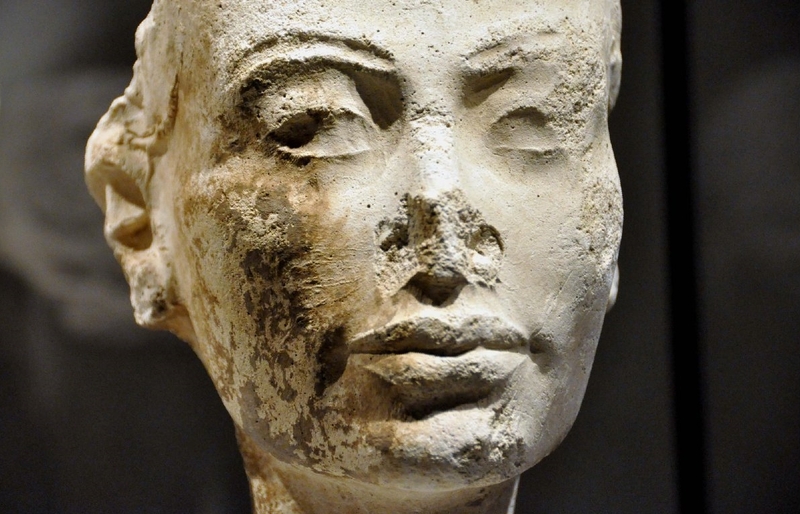 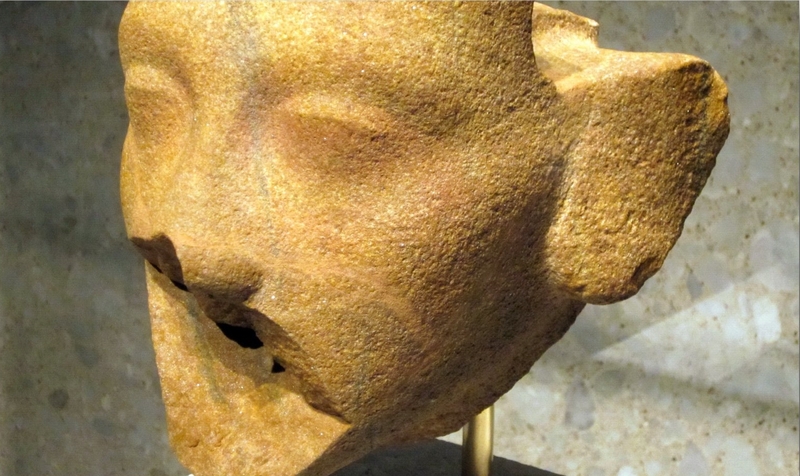 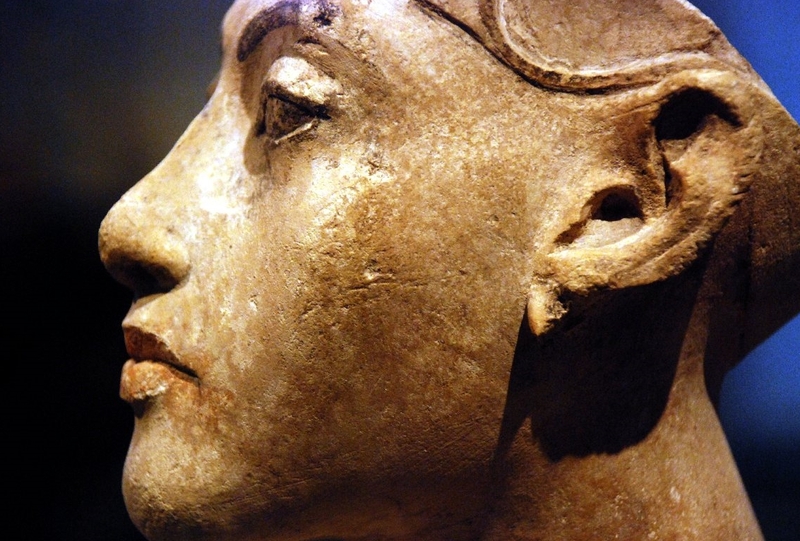 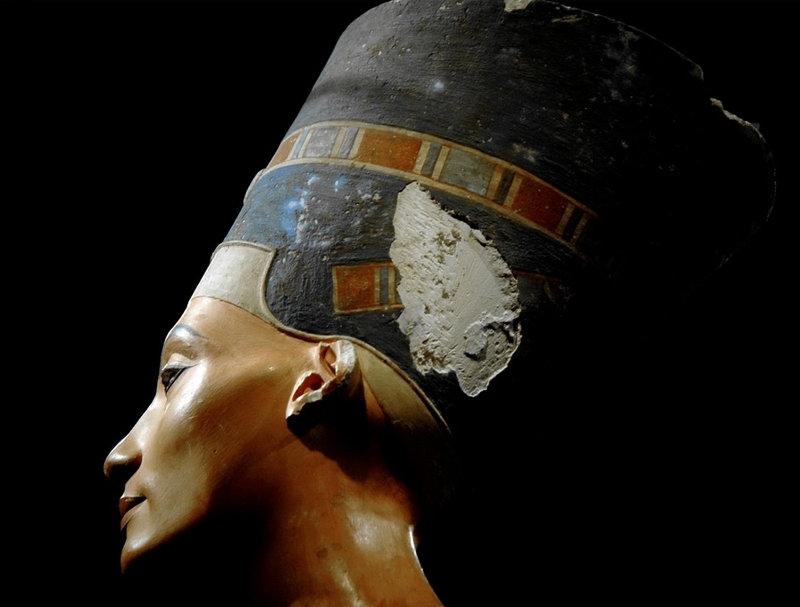 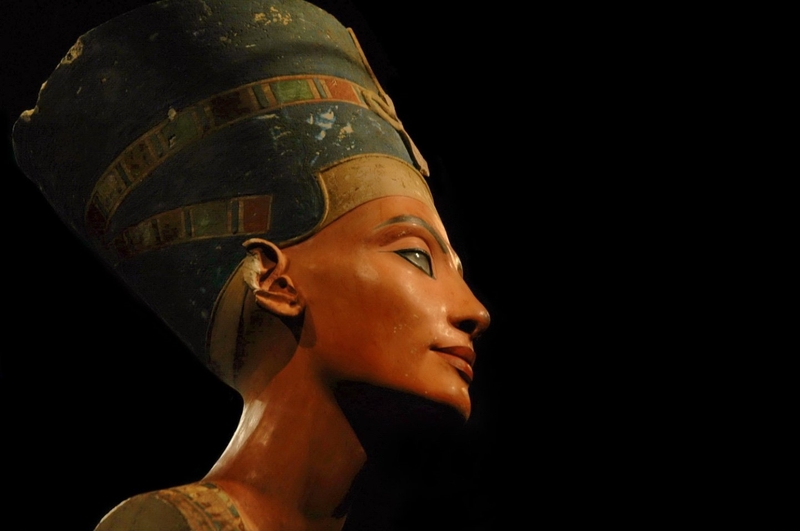 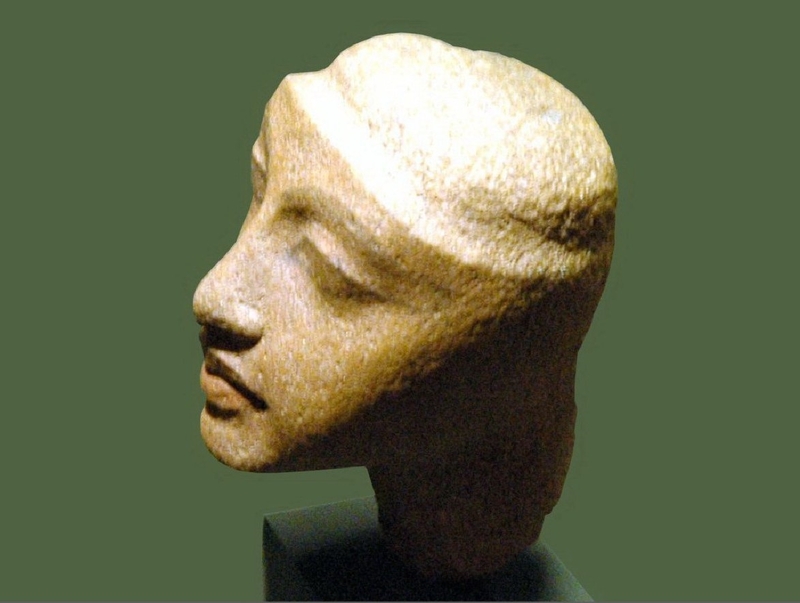 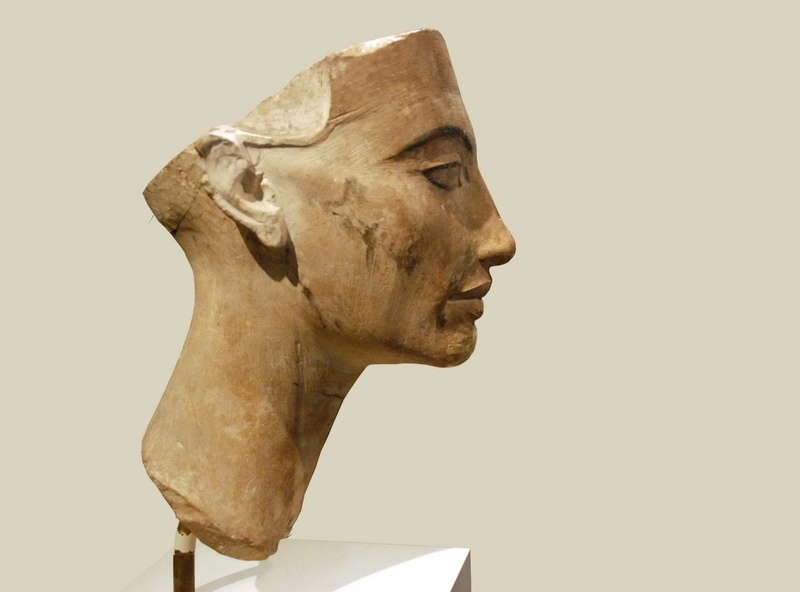 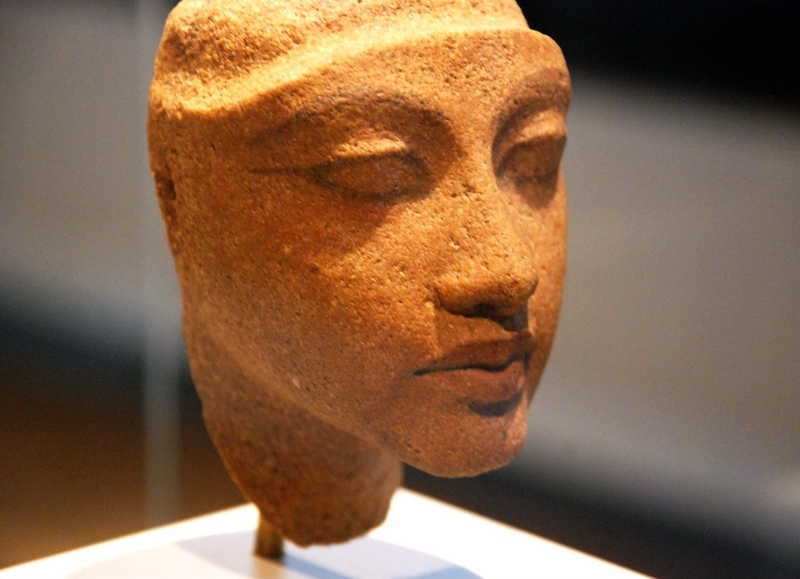 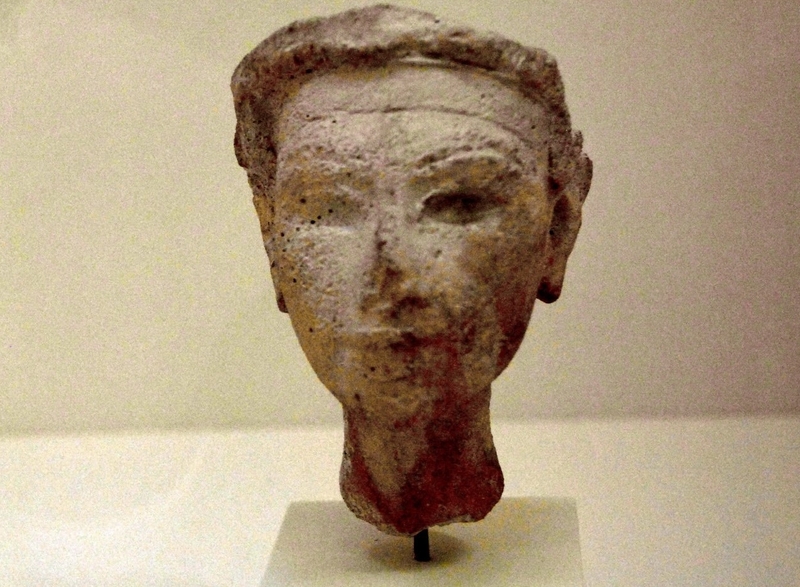 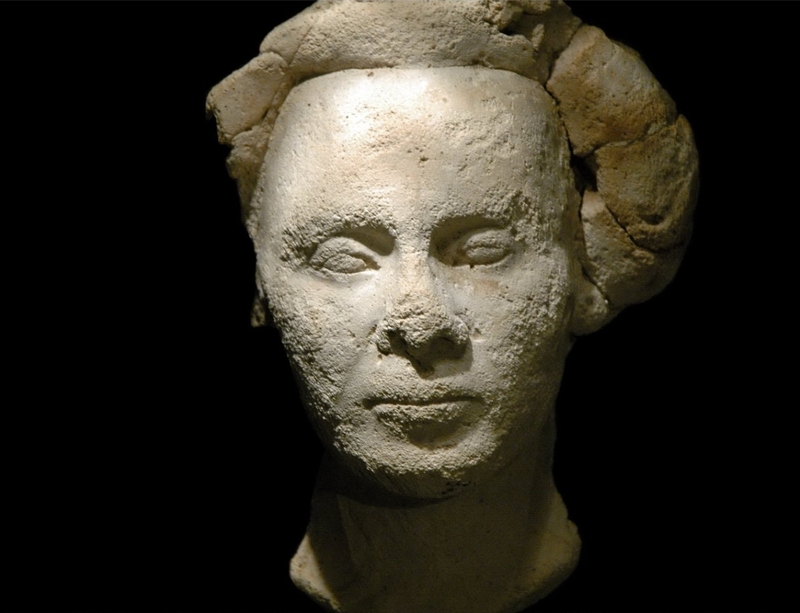 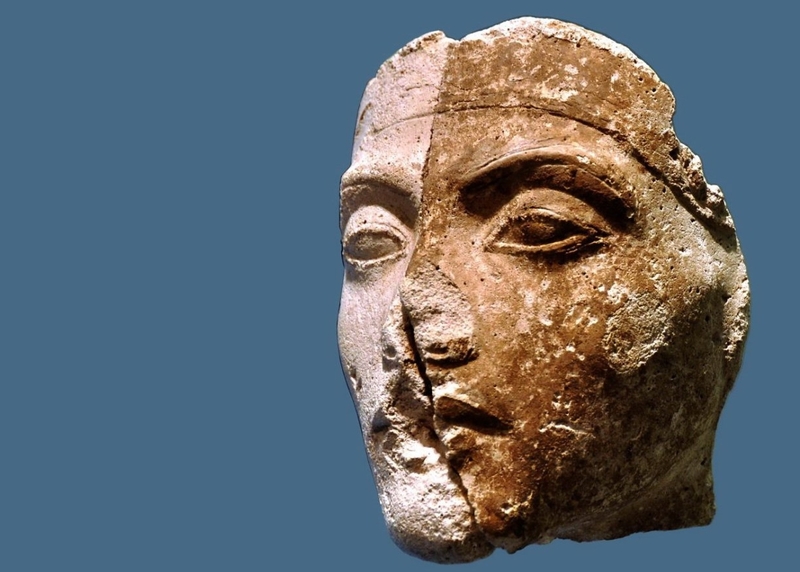 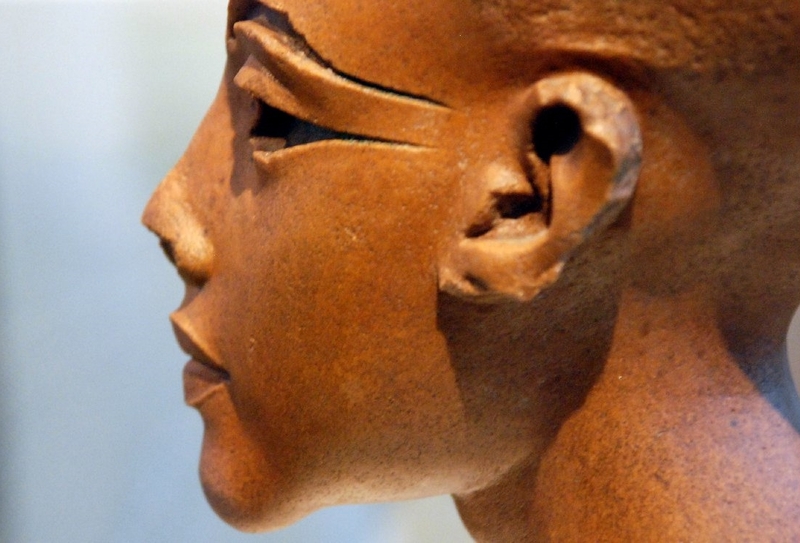 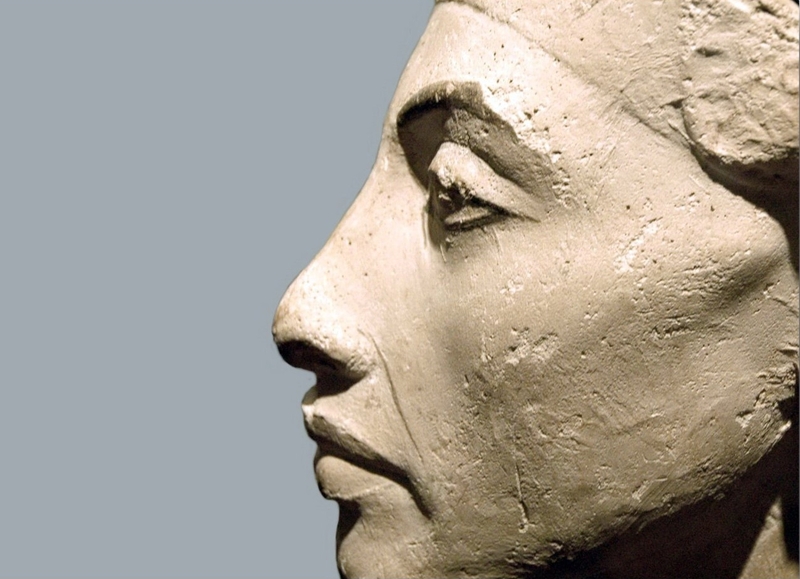 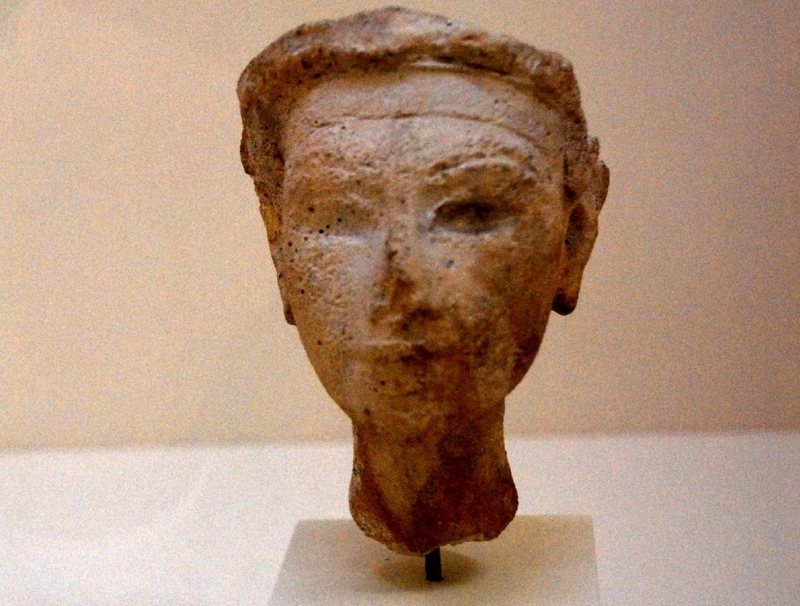 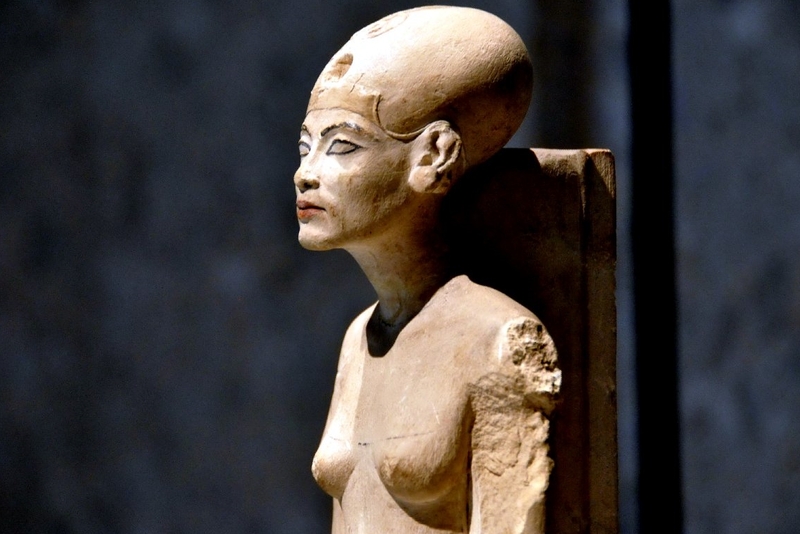 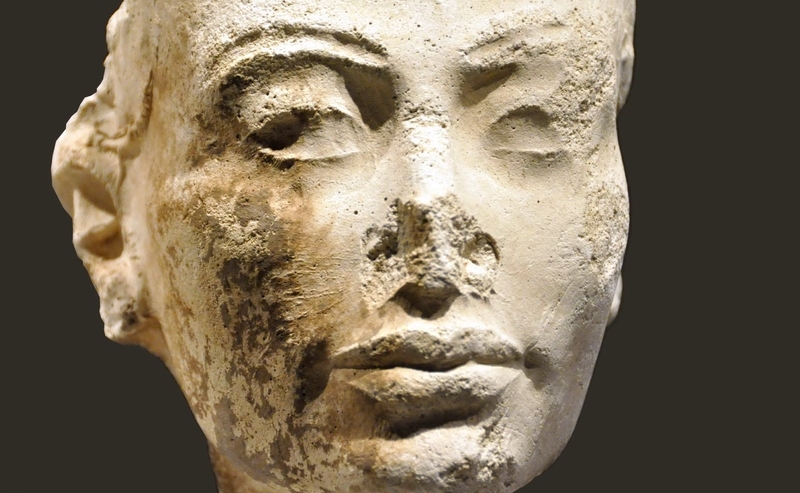 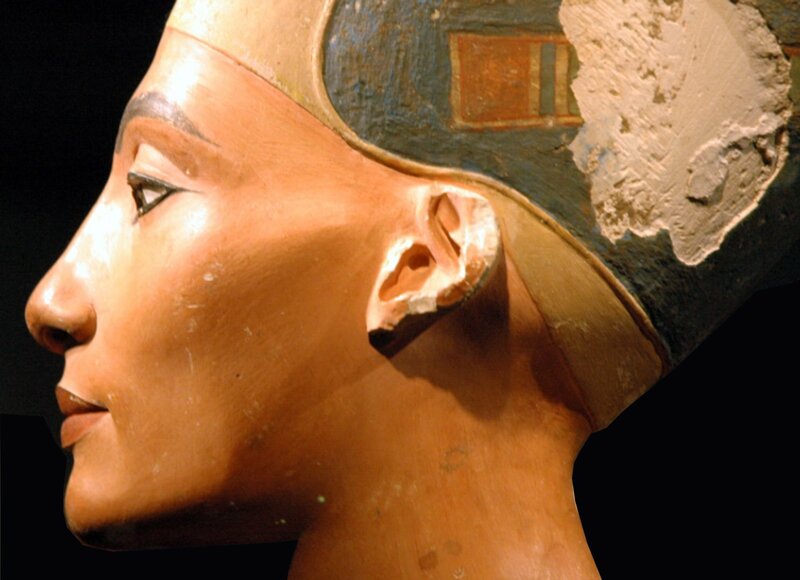 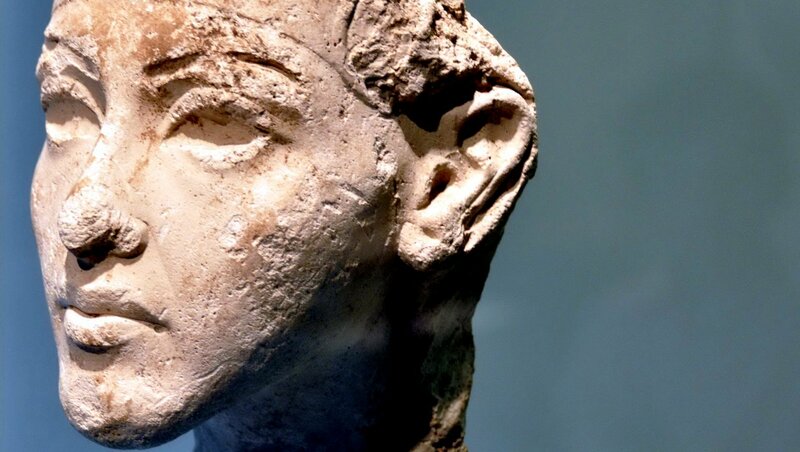 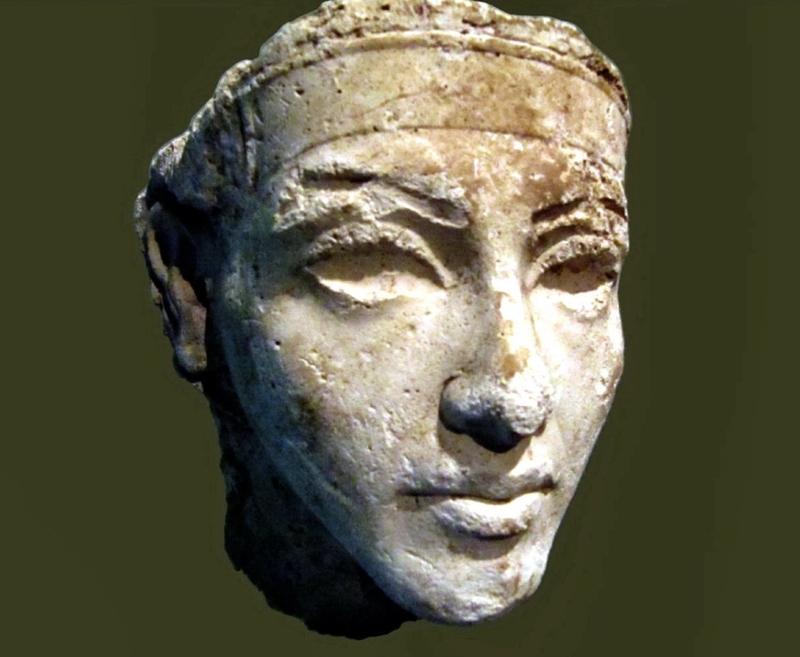 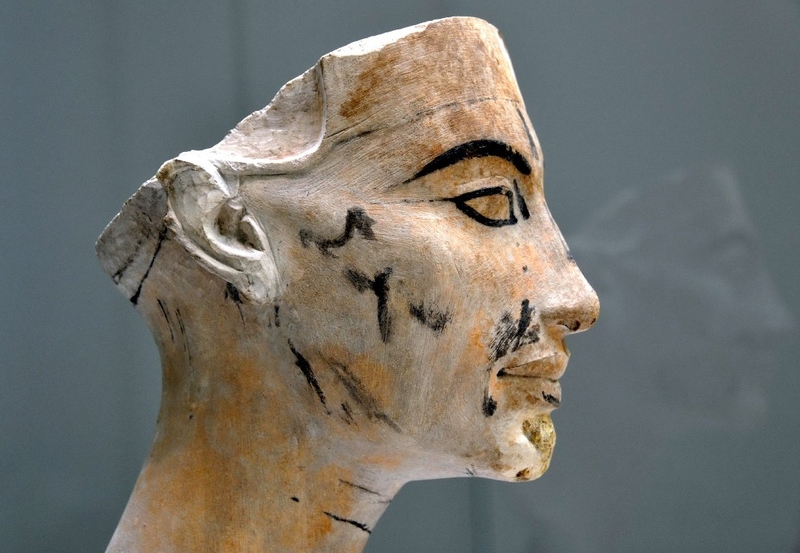 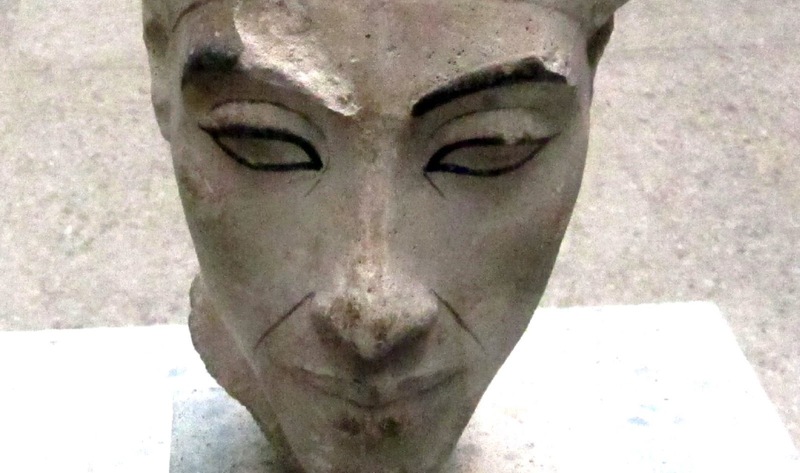 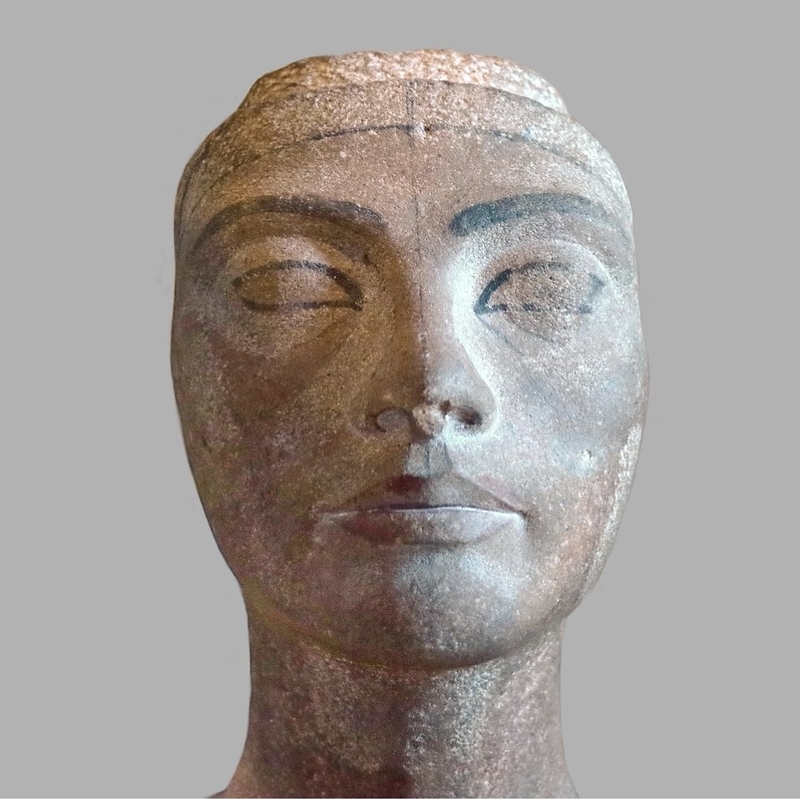 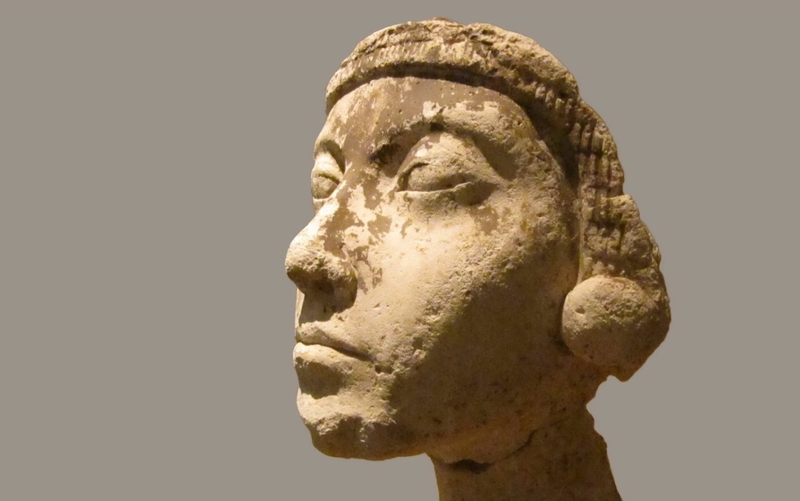 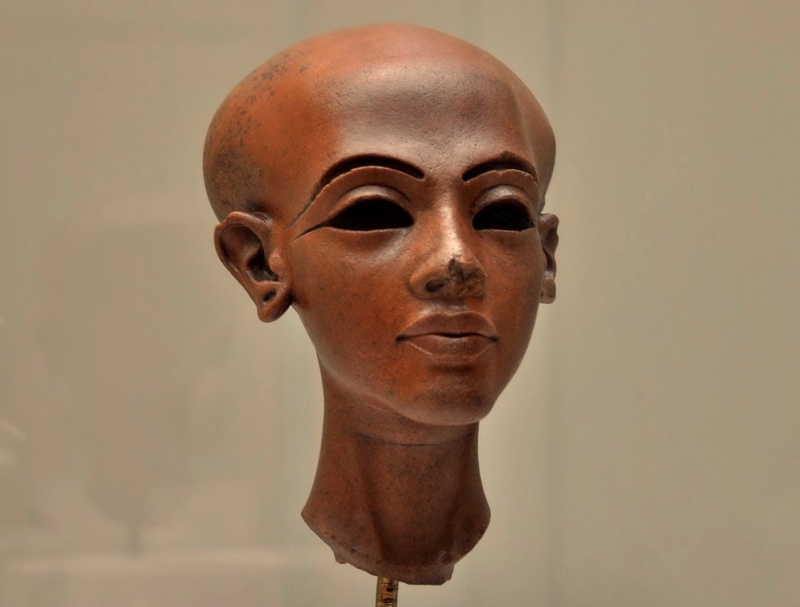 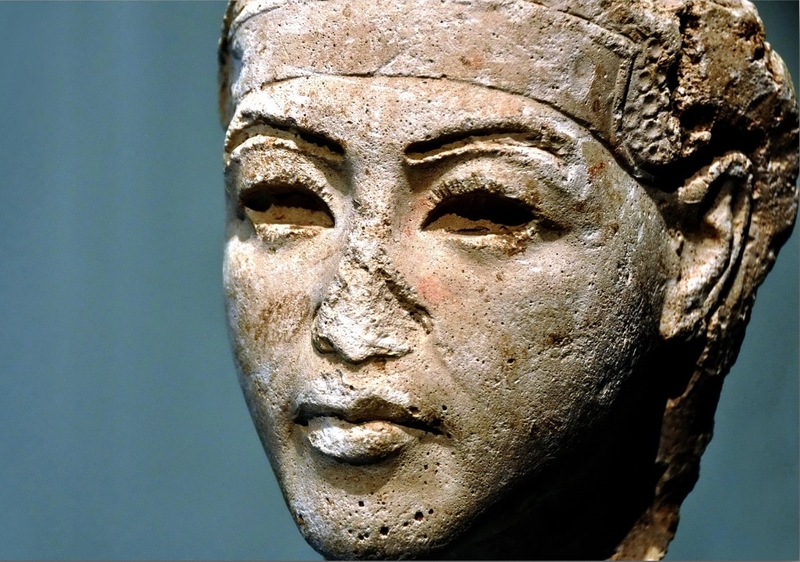 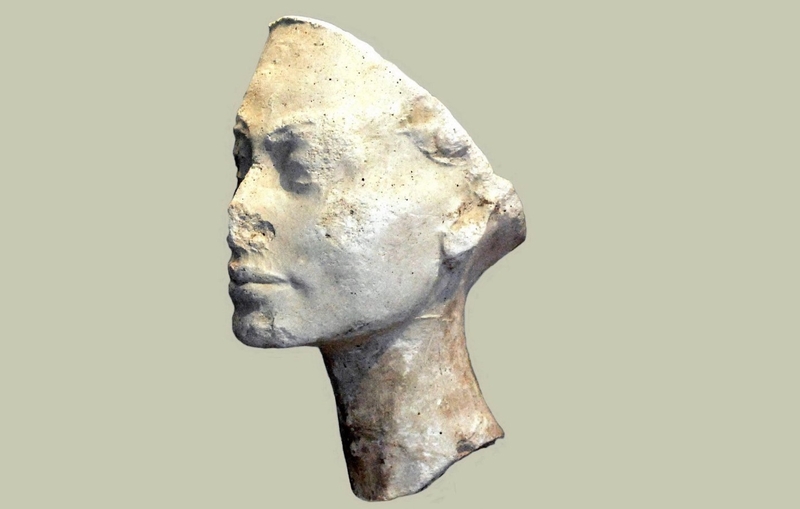 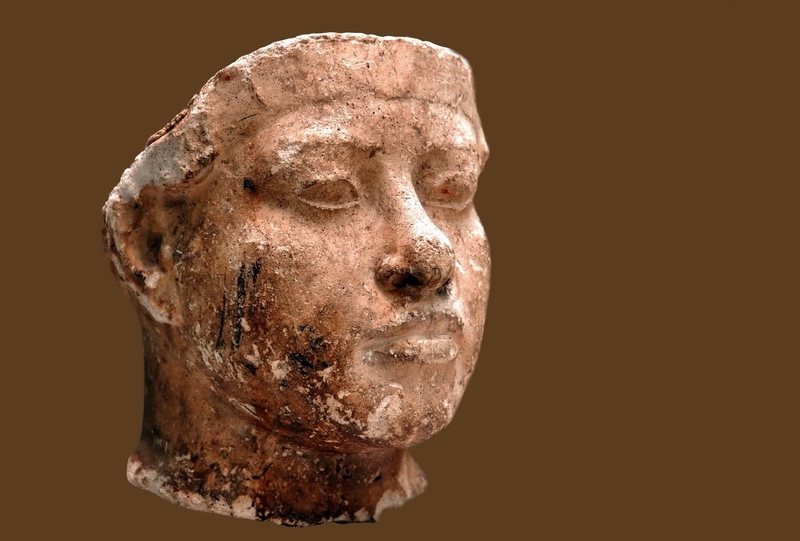 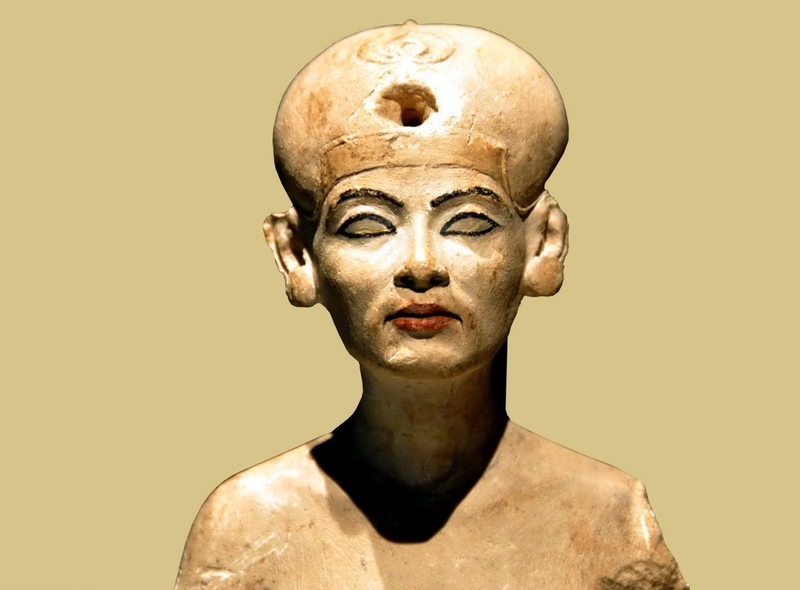 Tra i vari oggetti d'arte scultorea recuperati dalle stanze del laboratorio, quello di gran lunga più conosciuto è il celebre busto policromo della Grande Sposa Reale Nefertiti**, ritenuto un modello originale destinato ad altri scultori perché ne facessero delle copie. 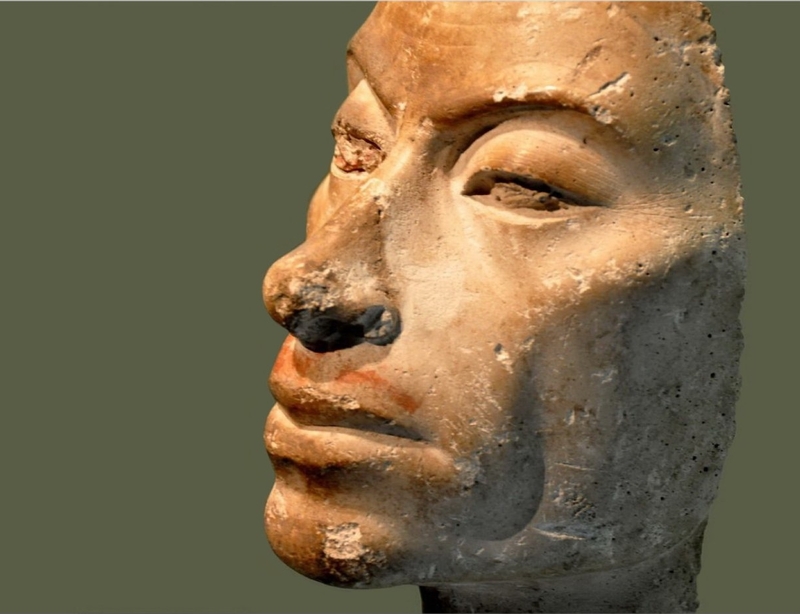 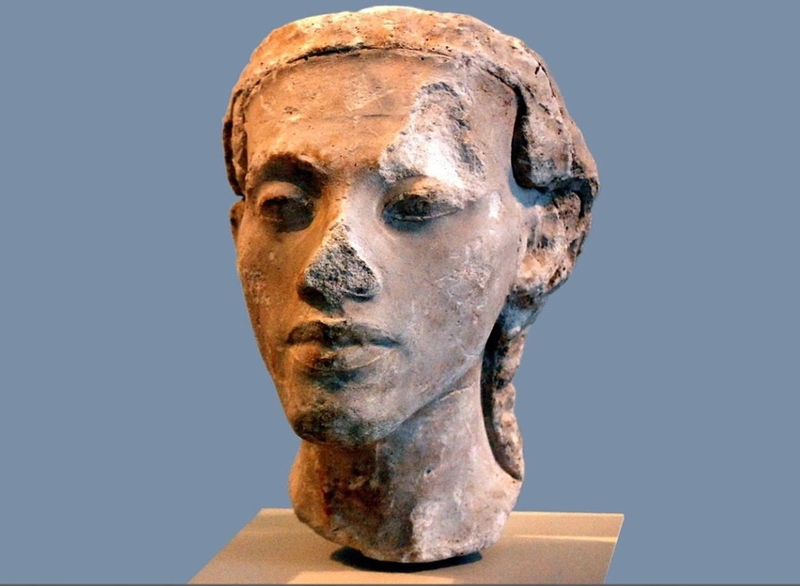 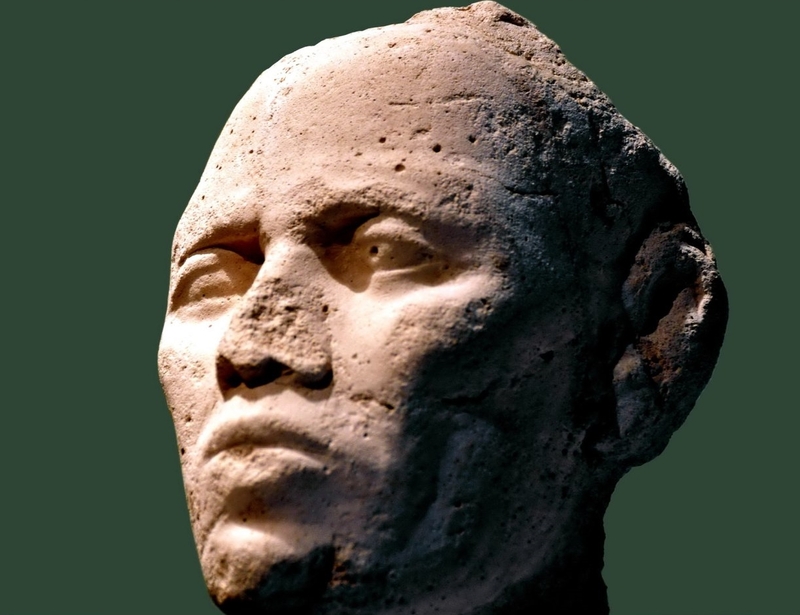 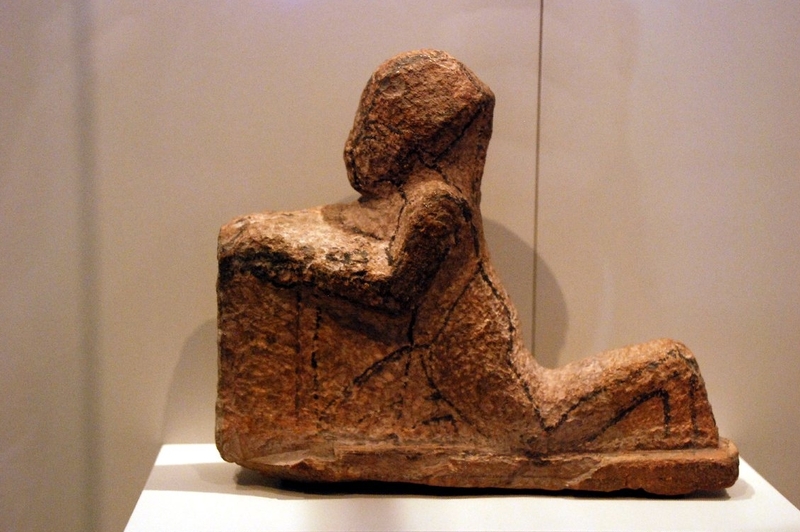 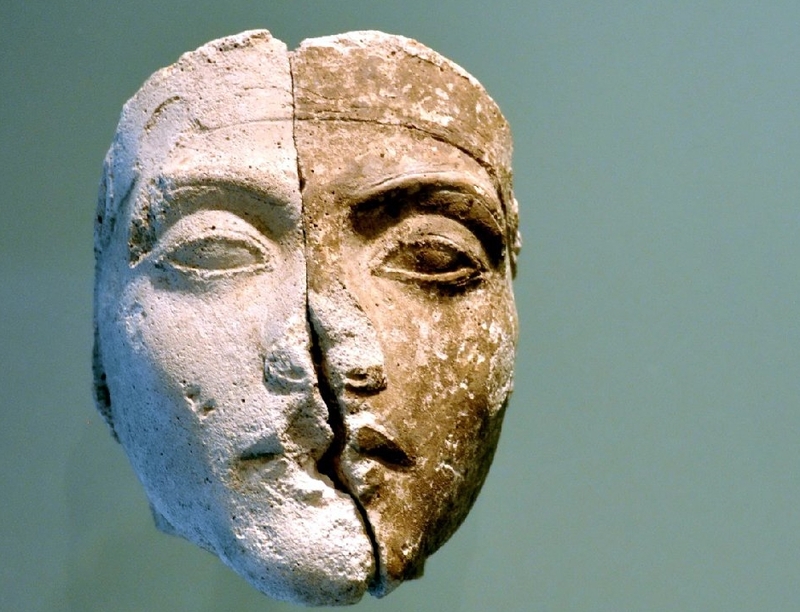 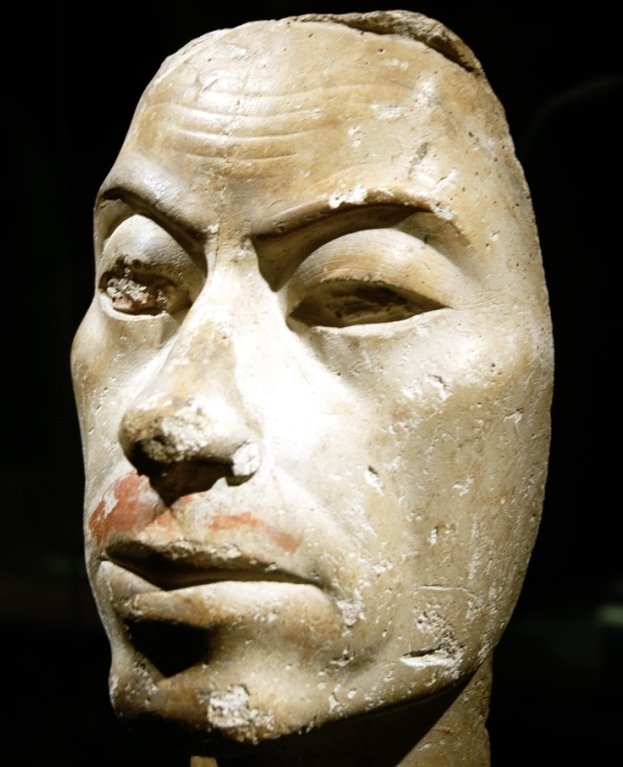 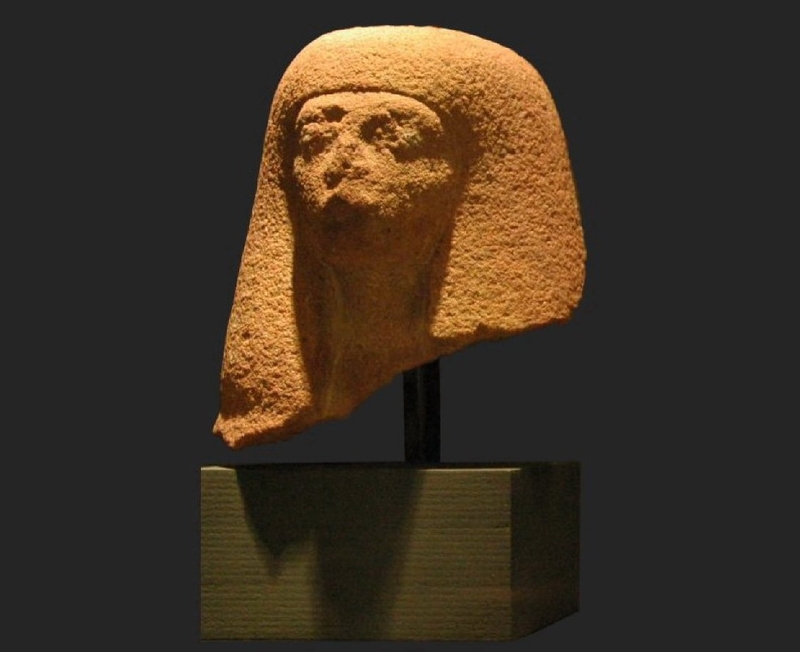 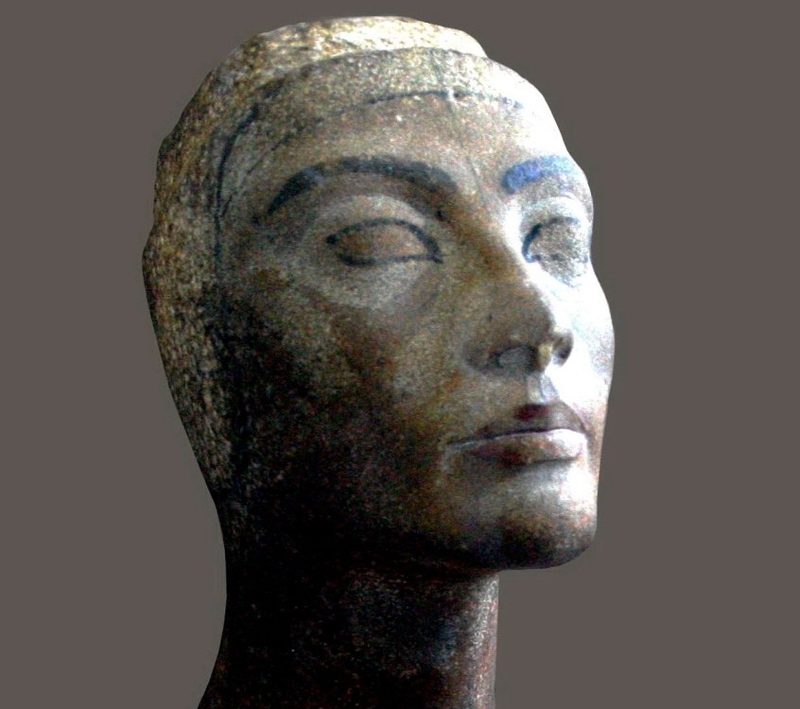 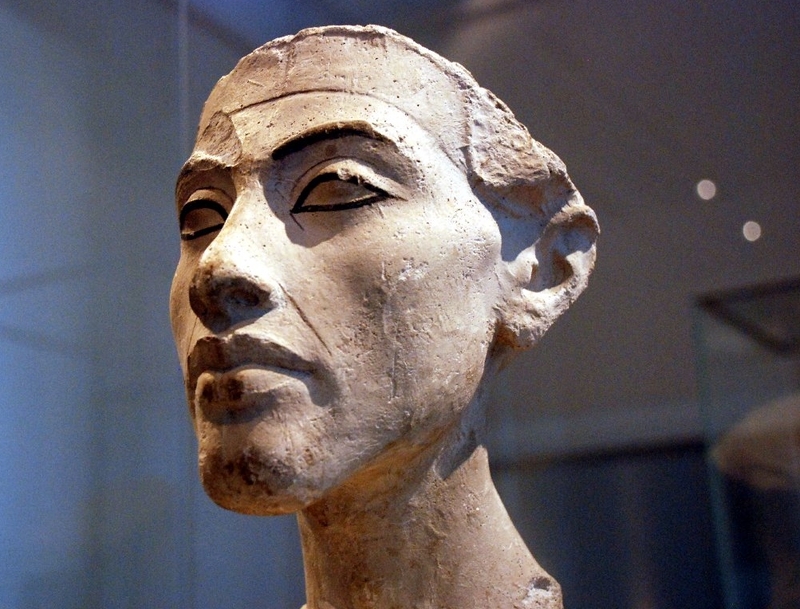 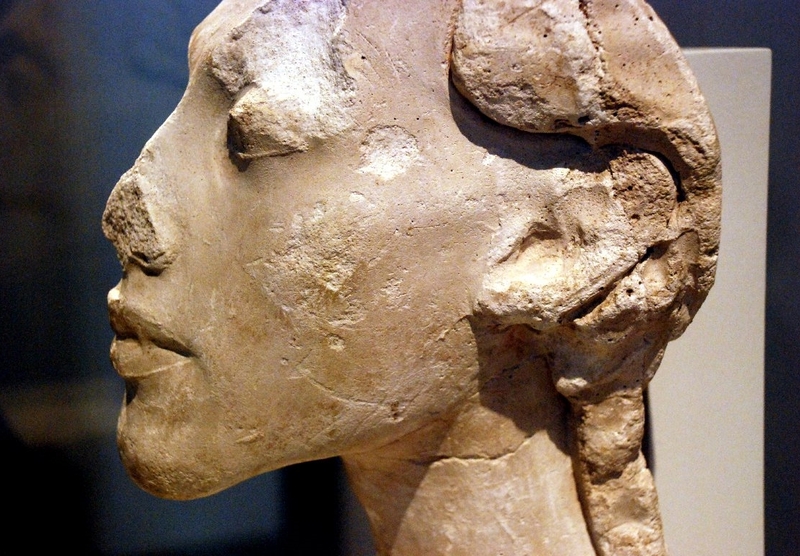 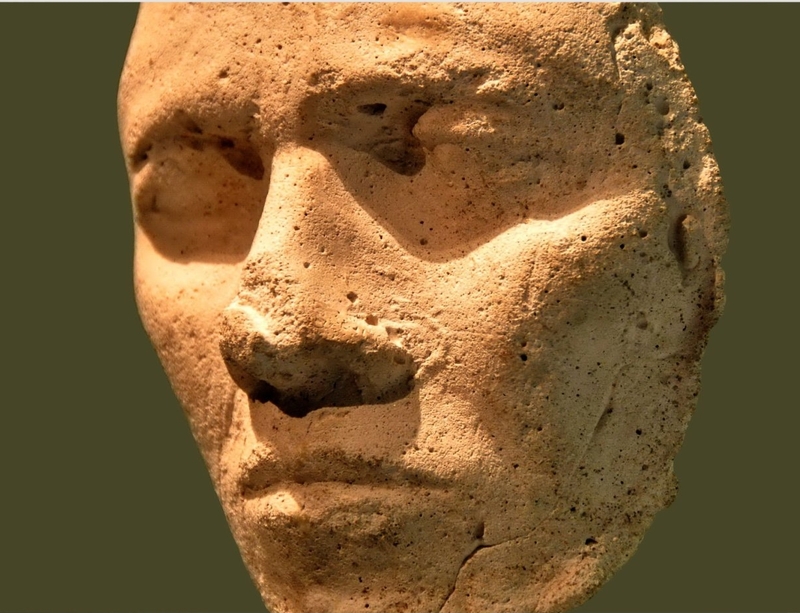 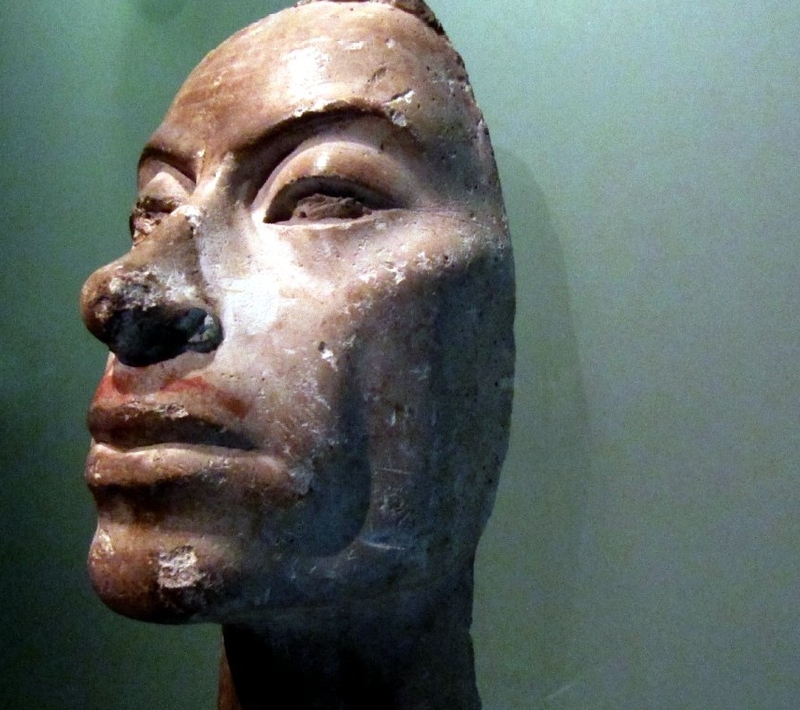 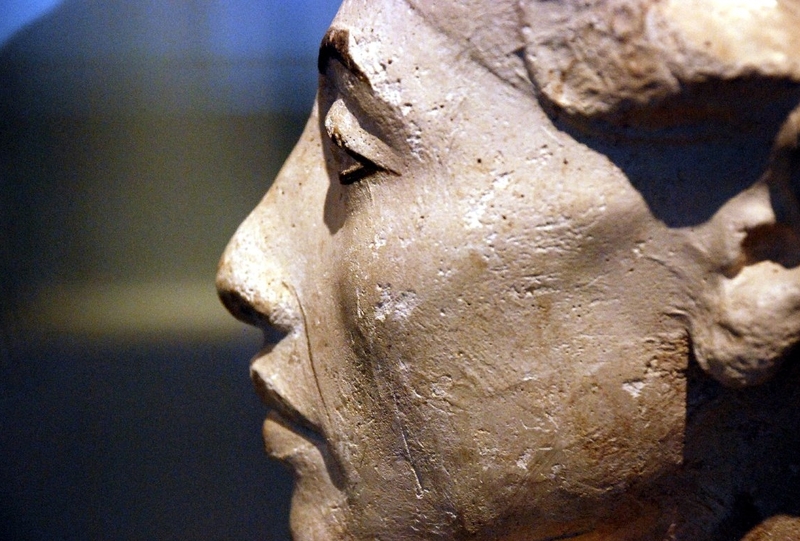 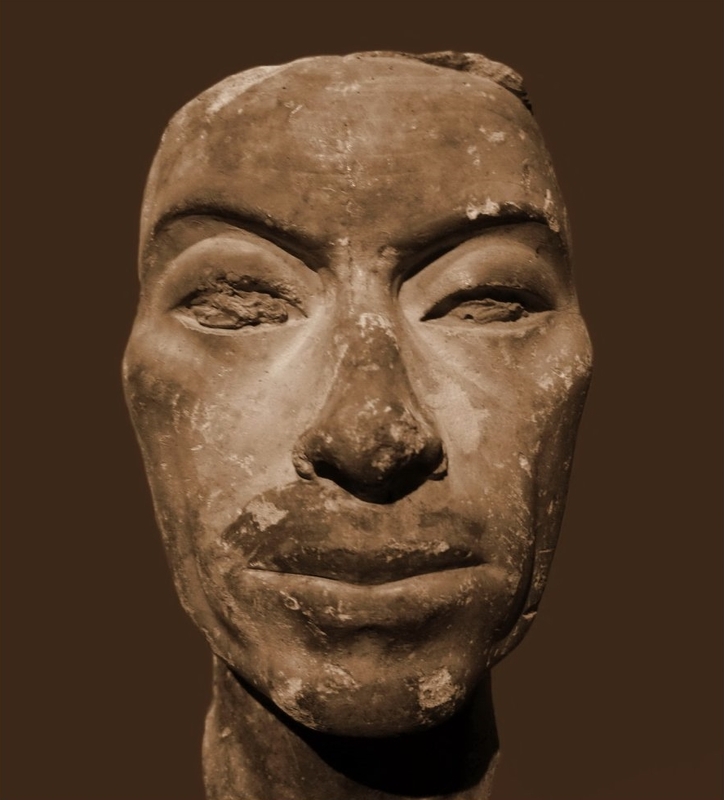 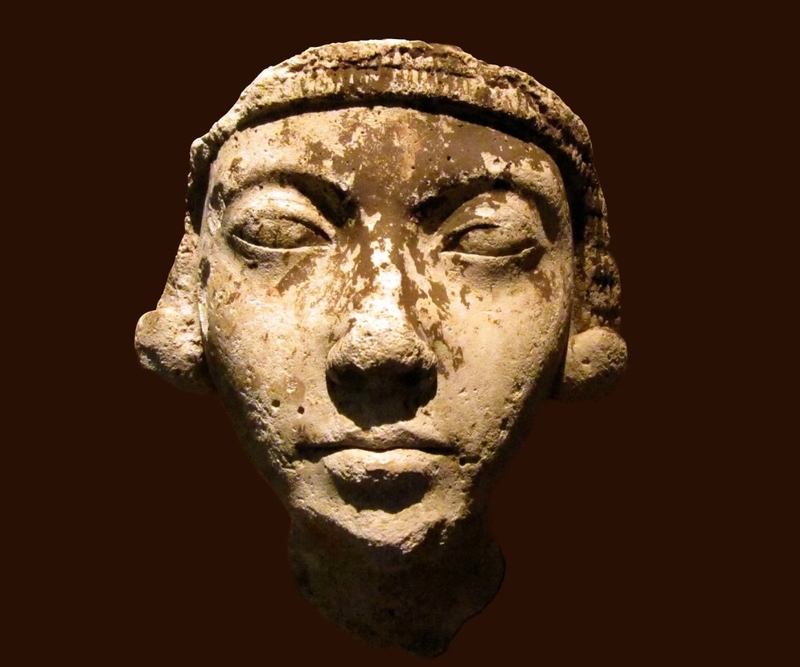 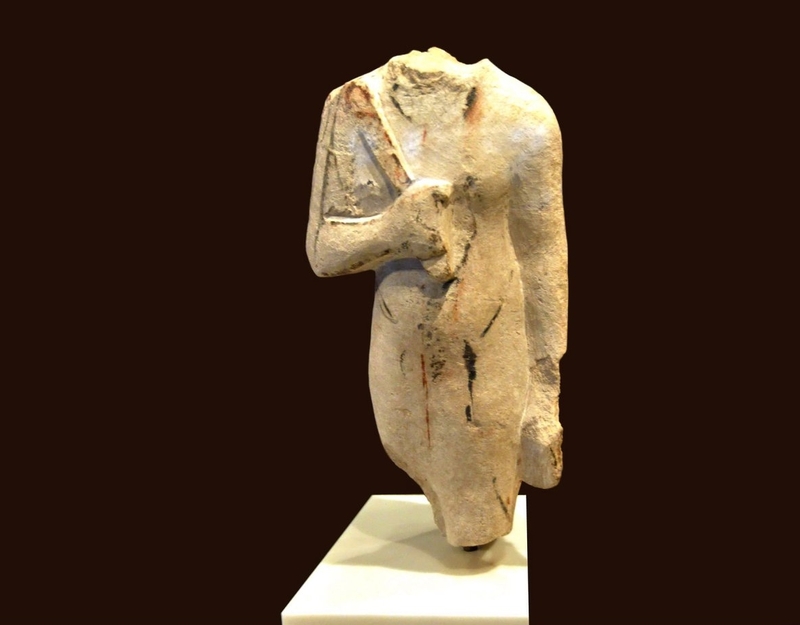 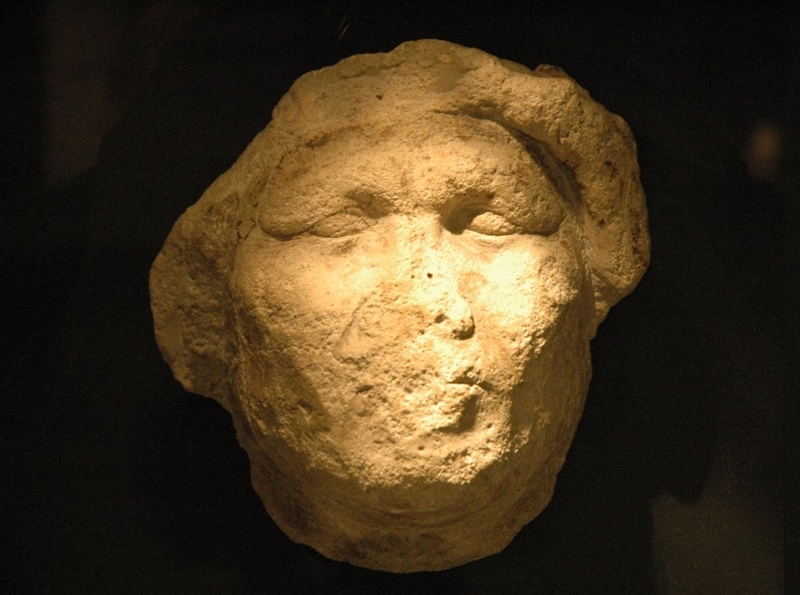 Oltre a questo famoso busto, vennero ritrovati una ventina di calchi in stucco di volti e di teste; in alcune di queste opere sono stati identificati svariati membri della famiglia reale tra cui Akhenaton stesso, l'altra sua moglie Kiya, il padre Amenhotep III ed il funzionario e futuro faraone Ay. 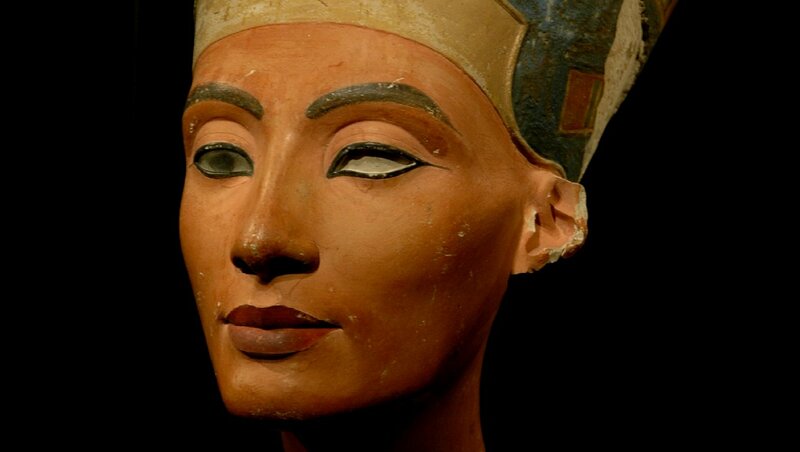 Un paio di pezzi rinvenuti nel laboratorio ritraggono nobildonne visibilmente avanti con gli anni: un caso assai insolito nell'arte egizia, dove queste venivano normalmente idealizzate come bellissime giovani a prescindere dalla loro reale età. 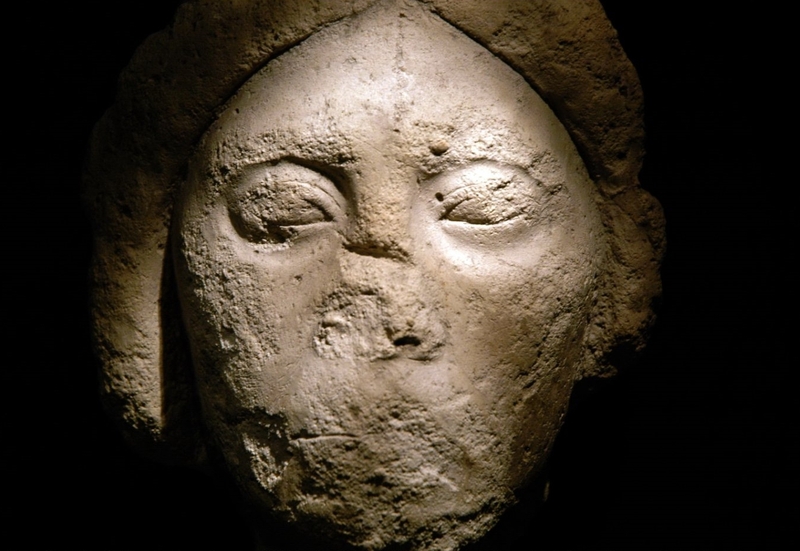 Uno dei volti di stucco rappresenta una donna di una certa età con profonde rughe sulla fronte, pieghe all'estremità degli occhi e vere e proprie "borse" sotto a questi. 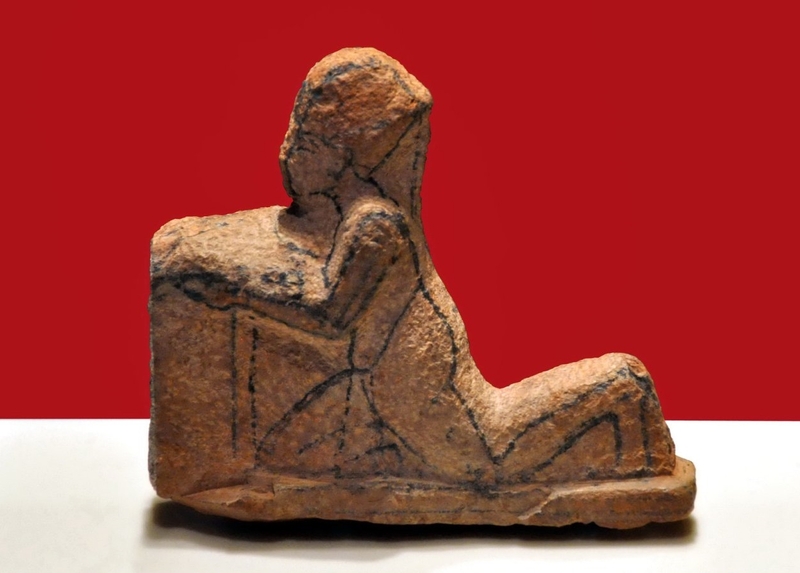 "una varietà di rughe maggiore di qualunque altra rappresentazione di nobildonna dell'antico Egitto". 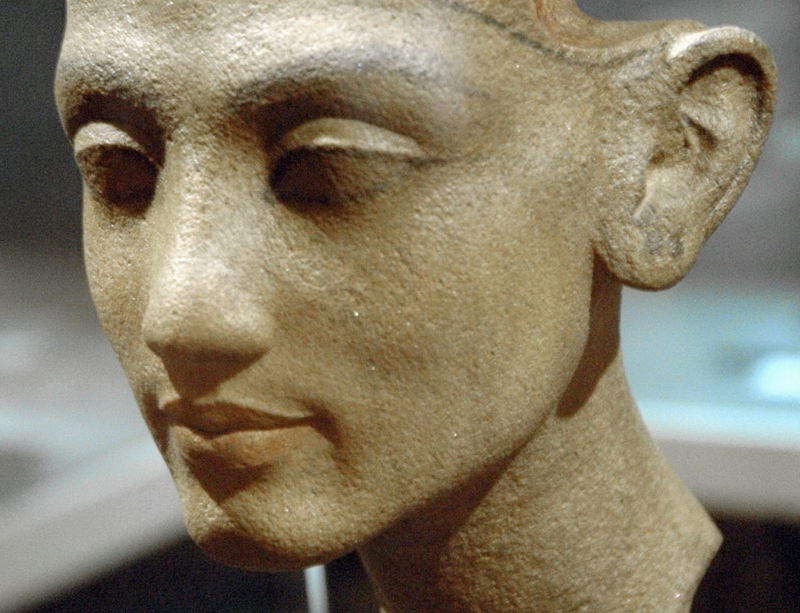 Nel laboratorio si rinvenne anche una statuetta rappresentante una non più giovane Nefertiti**, raffigurata con il ventre cascante, le cosce ingrossate ed una linea curva alla base dell'addome, quasi a voler dare conferma dei numerosi bambini che la regina diede alla luce, forse per trasmettere un'idea di fertilità.